Take a ride on the NH&D main line from the Austin depot in New Haven to the NRR station in Ansonia! You are now on Track 4A, which runs from New Haven to West Haven. For a fun, narrated flyover tour of the NH&D main line, click here! [4.1] The locomotive heading our consist will be NHD&A #1. 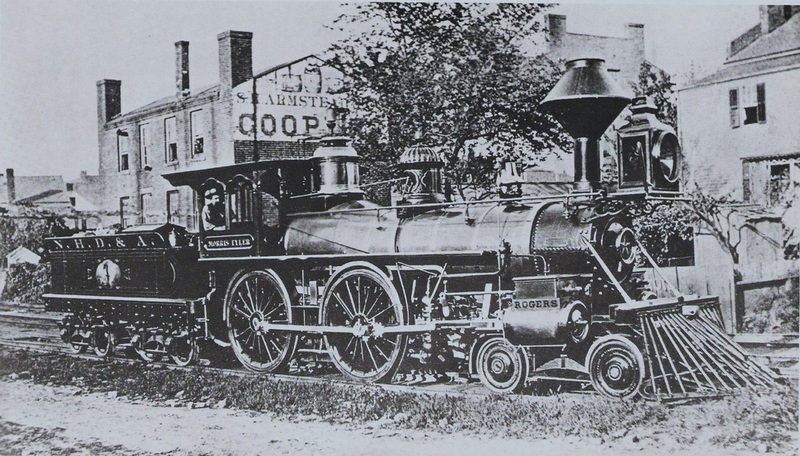 This 4-4-0 American-type, coal-burning steam engine was produced by Rogers Locomotive Works and was released on February 13, 1871. We are not sure when this shot was taken, but we think it was after a repainting, perhaps after damage due to accidents. See Track 4, MP 3.2.1 for discussion. The scene here is in the Elm City along the track of the New Haven and Northampton RR, also known as the Canal line. 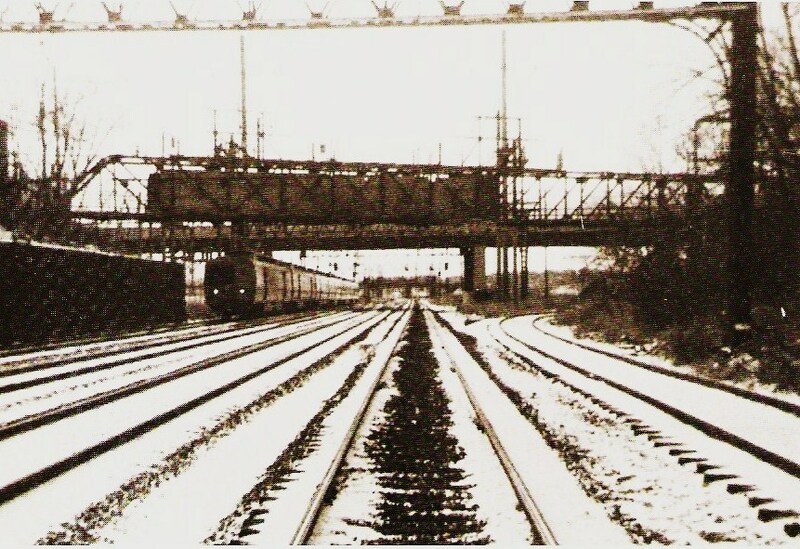 Early on, the Derby road used some NH&N trackage and its dock facilities. 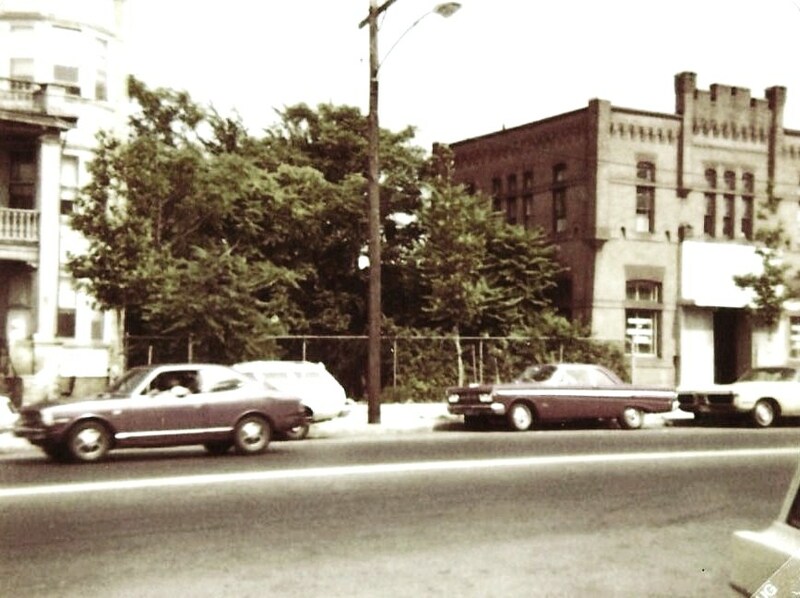 This location was near the shops of the New Haven Car Co. where the repainting may have been done. [4.2] Note the 'GEM ST' on the fence above the cowcatcher. This street still exists today off Dixwell Ave. This link should take you there. The engine appears to be facing south and Gem St. is the unpaved road paralleling the track in front of the locomotive. 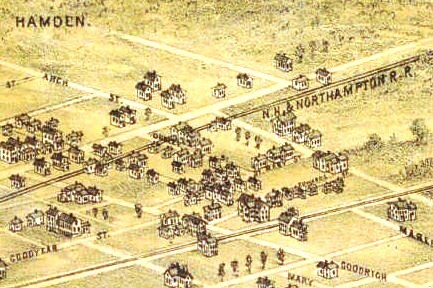 The shot above is from the 1879 bird's-eye map of New Haven [click here]. 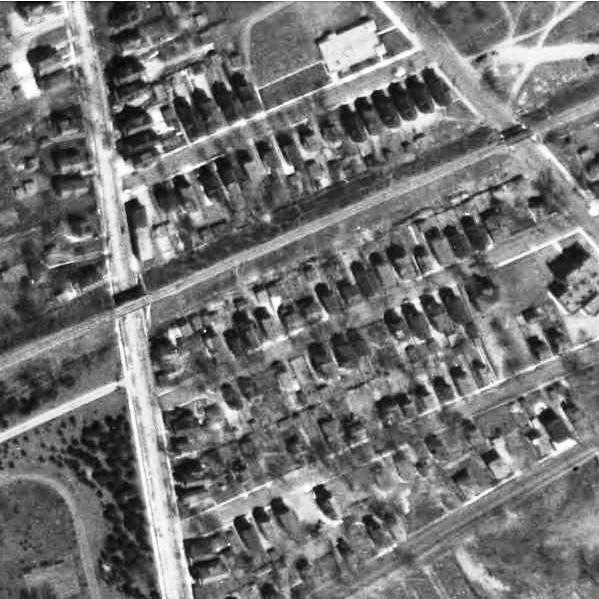 Gem St. is unlabeled but runs along the track above Goodyear St. seen in the lower left corner. 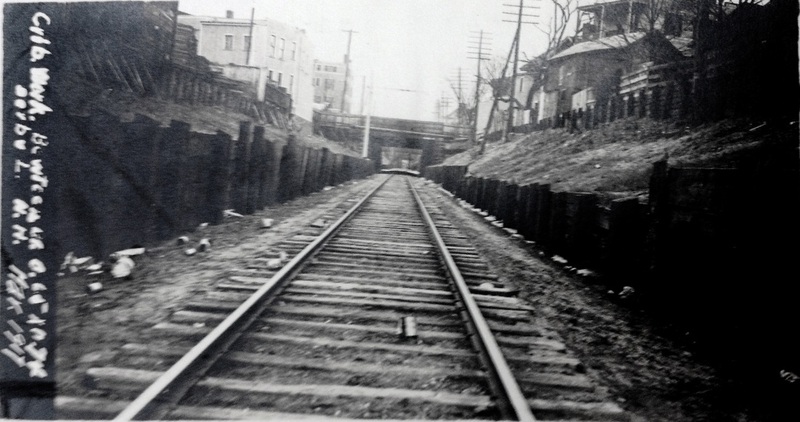 [4.3] Access to the NH&D's first terminus in New Haven was via trackage rights on the Canal road. This was on the westerly of three tracks that sat in the old canal bed under the the Austin depot, pictured above. 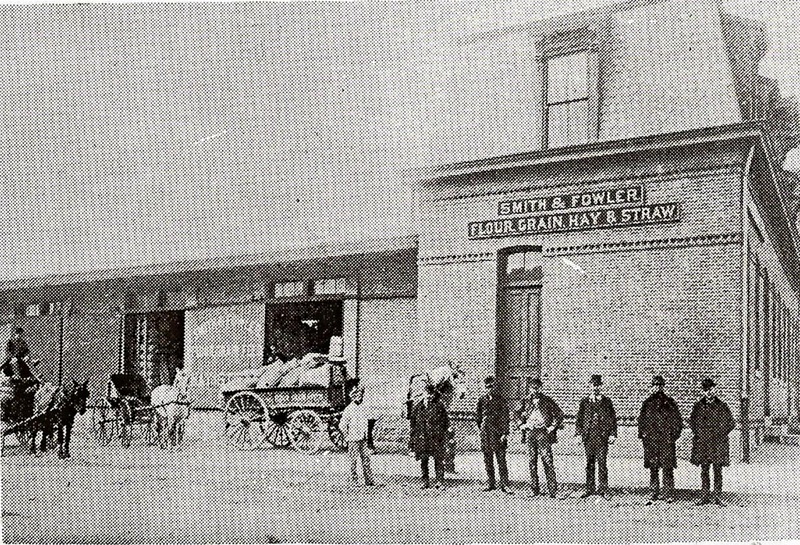 The depot stood at the corner of Chapel St. (on the right) with the main entrance facing Union St. It was designed by Henry Austin and opened late in 1848. 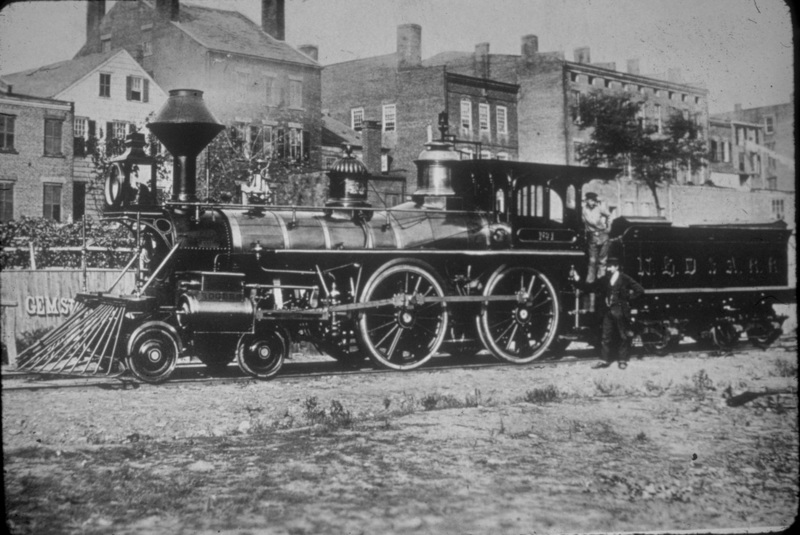 [4.4] This is the same engine as above in what we now think was its appearance as delivered, named the Morris Tyler in honor of the railroad president. It appears to be posing just below the Austin depot. The engine is pointing south and sitting on the westernmost of three tracks where the Derby road actually begins. 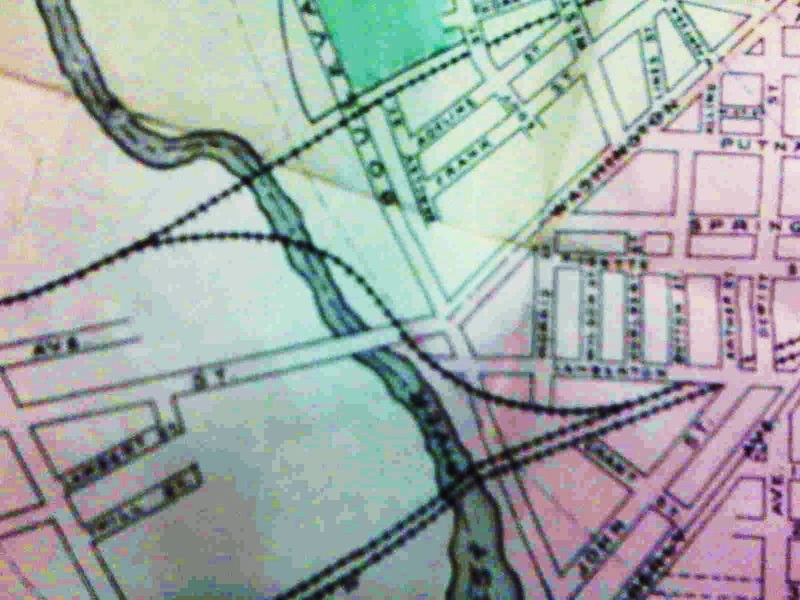 The NH&D track then curves to the engineer's right to go through Custom House Square. [4.6] This is reportedly an 1870 Benham city directory map, which actually seems to reflect a slightly later date. Notice the 'new depot' already shown for the planned NYNH&H station at the foot of Meadow St. which would not open until 1875. 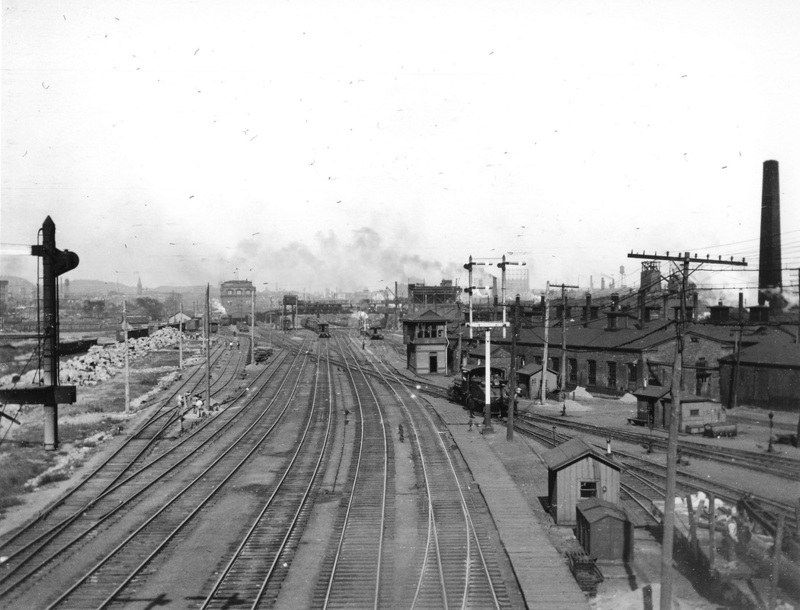 The NH&D is shown as complete through to the old Austin depot at Chapel and Union Sts. 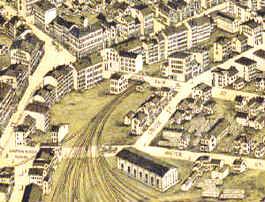 over to the right, but trackage beyond Custom House Square was not installed until just before the NH&D opened in August, 1871. The NH&D track heads west along Silver St.
[4.9] Here is a front view of the Derby road's Commerce St. station, seen from the corner of Silver St. 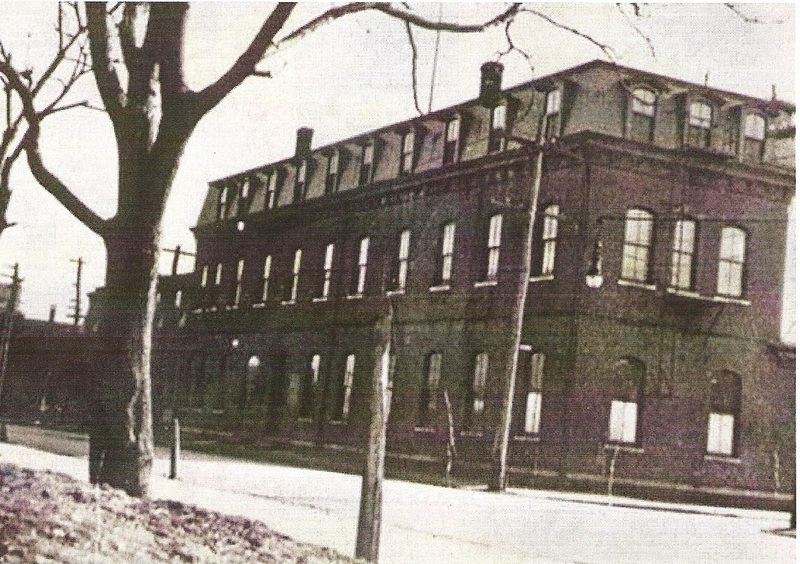 This building was refitted to open as the NYNH&H's first railroad YMCA on December 28, 1896. [HC/12/30/1896/11; NHDP/12/29/1896/01]. The Courant article carries the texts of the speeches of Vice Pres. Hall and Pres. Clark, the latter of whom said the company's efforts were for the "comfort, rest, amusement and instruction" of the railroad's employees. The annual report for 1897 reported that "twenty bedrooms, six bathrooms, a bowling alley, reading and social rooms were provided at a total cost of $17,800" for the new facility [NHAR26.1897.6]. 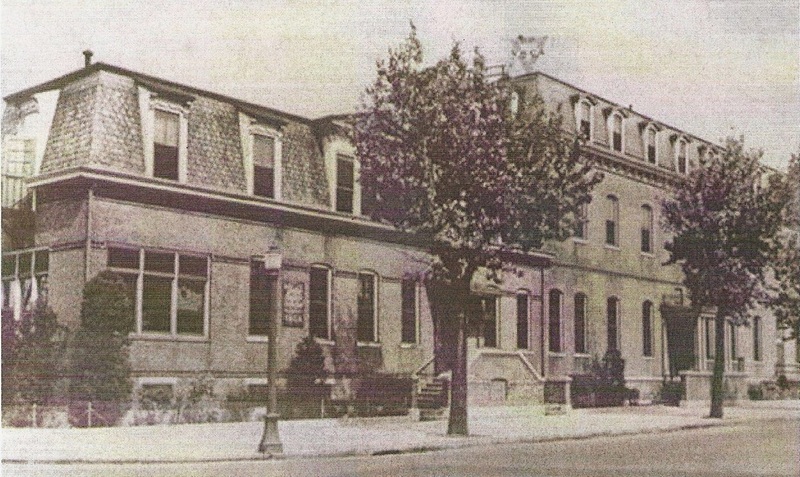 The plain appearance of the building, the lower-to-the-ground profile, and the lack of a porch at the entrance as seen in later photos would date this shot to the late 1890s or early 1900s. 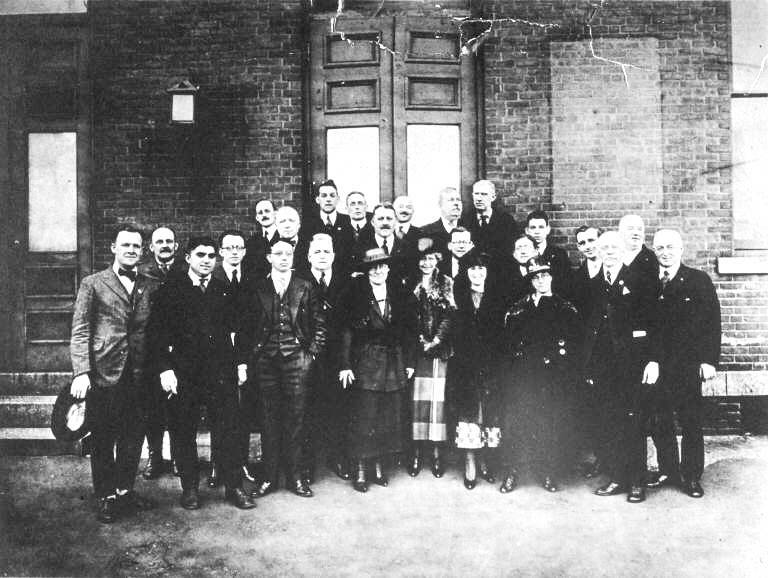 [4.10] This photo is in the Historical New Haven Digital Collection from Yale [click here] and titled "Railway YMCA Members" with a 1925-1935 date range. To us, the building looks more like the photo above this one than the later view at MP 4.11.2 below. The lower-to-the-street profile and the lack of a porch would seem to argue for pre-1920. 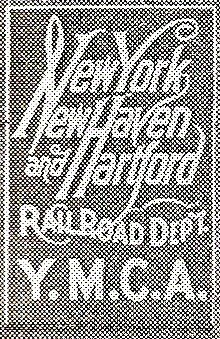 The missing plaque may have read New Haven and Derby Railroad Company, perhaps in script herald like the NYNH&H's own. That leads to the exciting possiblity that this could even be around the opening of the new YMCA in 1896. The location seems to be at the entrance to the 1888 wing. The more well-to-do gentlemen may be the board of management [BOM], joined by some regular members and ladies from the women's auxiliary. The YMCA was open to all railroad workers and their families, whether the men were members or not. There is a further possibility that this is the 1889 camera club group seen on Track 5, MP 5.20.2, though no hats or faces yet seem like obvious matches. [4.11.2] The photo shows the YMCA with a facelift and an uplift to a higher foundation now calling for more steps, some newly installed porches, and reconfigured doorways. The triple-paned window has been installed on the south front face of the building, similar to the window that replaced the old door on the south end. Roof alterations have also been made there for an emergency exit and fire escape, the need for which was noted in 1922 [BOM: 134]. The script herald plaque at right is now seen by the south entrance. With the newer lampposts also in use, most of this was probably done as part of the 1920 back-shifting and street changes. With the trolley freight operation having been shuffled over to Silver St., the 1878 'Annex' went fully to the YMCA as noted on maps later in the 1920s showing it operating with the entire building. The upstairs space may have been converted to 'rest rooms' for sleeping even earlier. 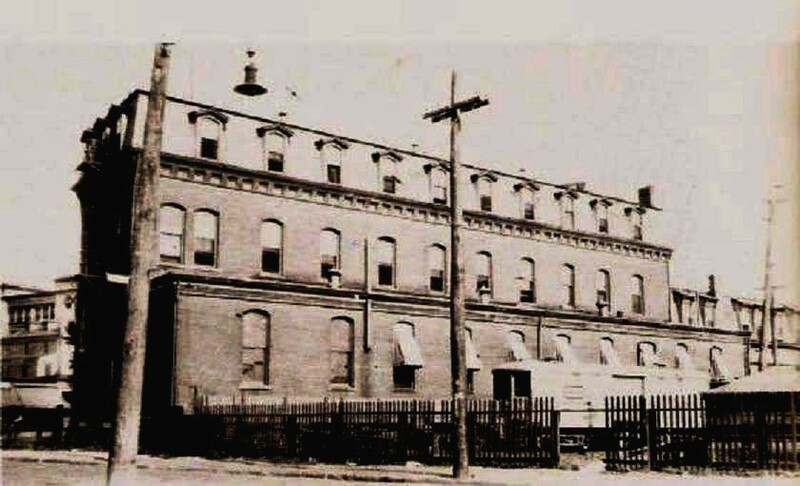 Note the sign, right of center, on the roof of the 1888 wing, visible in the prior photo as well. The inverted, equilateral, Red Triangle was adopted as the YMCA symbol in 1895 and signified the balance of Body, Mind, and Spirit, words that are sometimes seen on the three sides. Interestingly, there is a note in the BOM records that says the roof sign was not put up until 1919, 23 years after the YMCA opened. [4.11.3] The RR YMCA and the surrounding area is shown here on the 1915 valuation map, with the Silver St. yard behind it and before the changes of 1920. Click here for the entire map section. 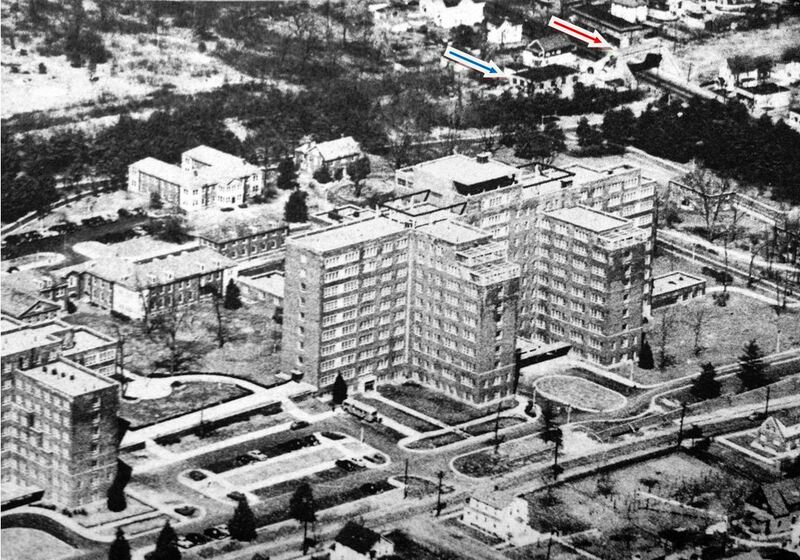 Our yellow arrow points to the GOB, the blue arrow to the trolley connection, the red arrow to the Commerce St. depot, now the RR YMCA, and the green arrow to the trolley express wing. 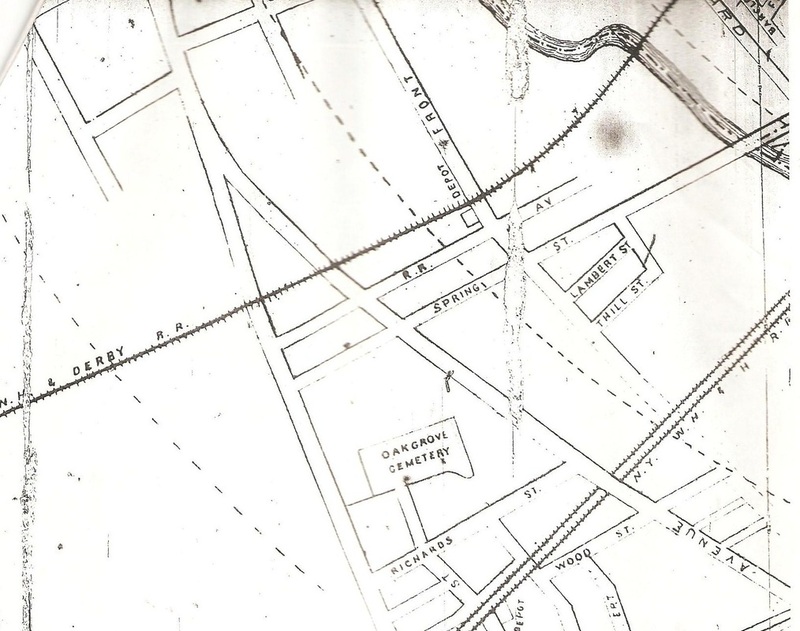 The darker dashed lines are the Connecticut Co. tracks on Meadow St. with the old Derby main tied in, not having crossed the street since 1892 through the site where the GOB was built and where the original NH&D facilities had been located. See Track 6, MP 6.6 for the events of 1892. 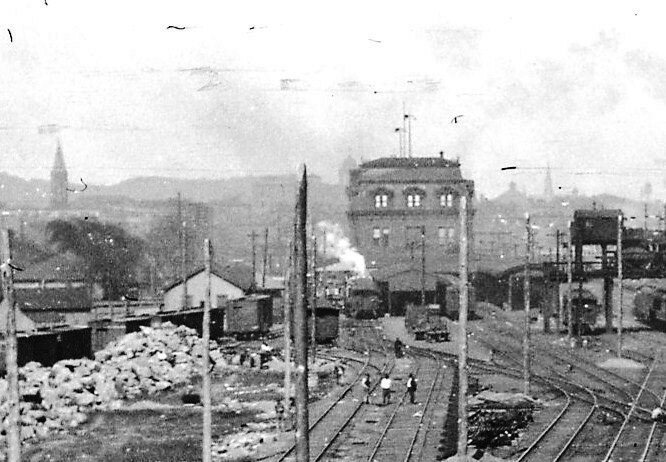 The 1878 Derby passenger station, now the south wing of the Commerce St. structure, once stood above the word 'Water' in West Water St.
[4.12] This photograph appeared in a 1912 city-planning pamphlet called Railroad Station Approach and Harbor Front Improvements. Click here for full document from Google Books. The view looks out to the Silver St. yard from the upper level of the RR YMCA. 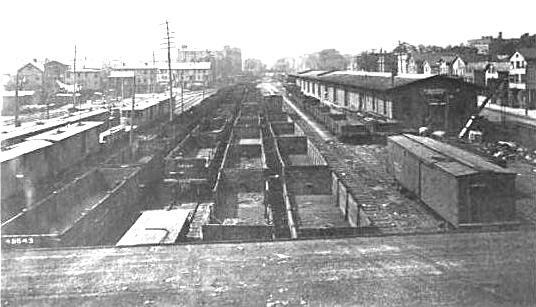 Note the Conn. Co. trolley express cars on the left-most track, where they are lined up along the old NH&D freight platform. This crowded scene is probably not unlike the busy final days of the NH&D/HRR operation, twenty years earlier, when 50 passenger and freight trains were coming into the Derby terminal most weekdays. [4.12.1] These photos appear in New Haven Streetcars [p.25], another of the wonderful Images of America series books put out by Arcadia Press. This was a Branford Electric Railway Association project. The Consolidated Railway Co., not to be confused with the NYNH&H itself, was created in 1904 as its streetcar holding company. By 1907 it was reorganized as the Connecticut Co. with the old Trolley Express Co. renamed as the Conn. Co. Express Dept. This system served 57 freight stations around the state. 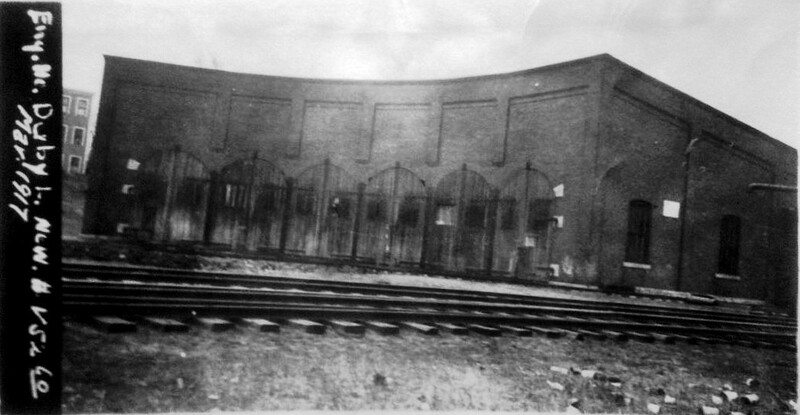 Seen here are rear views of the headquarters at the 1878 NH&D station and the Silver Street yard. 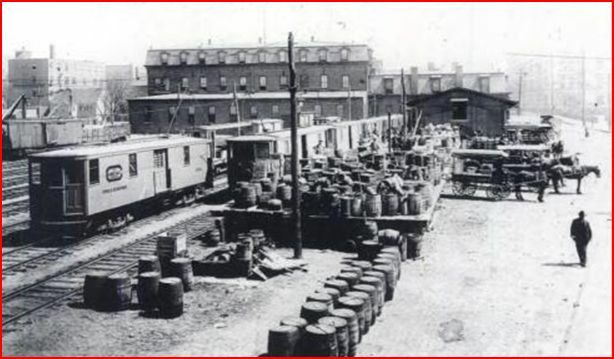 The left photo shows the GOB towering in the background, with boxcars to the right on the old NH&D main. 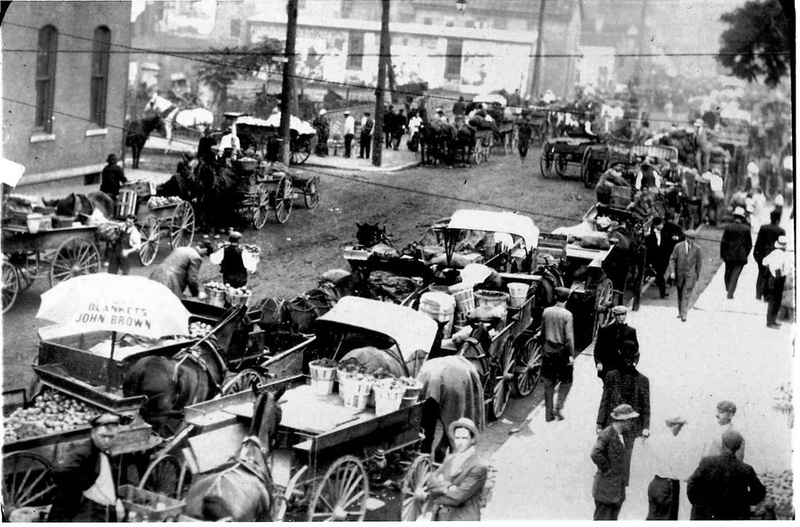 The second photo shows the street side with merchandise arrayed on the platform and horse-drawn wagons being loaded. 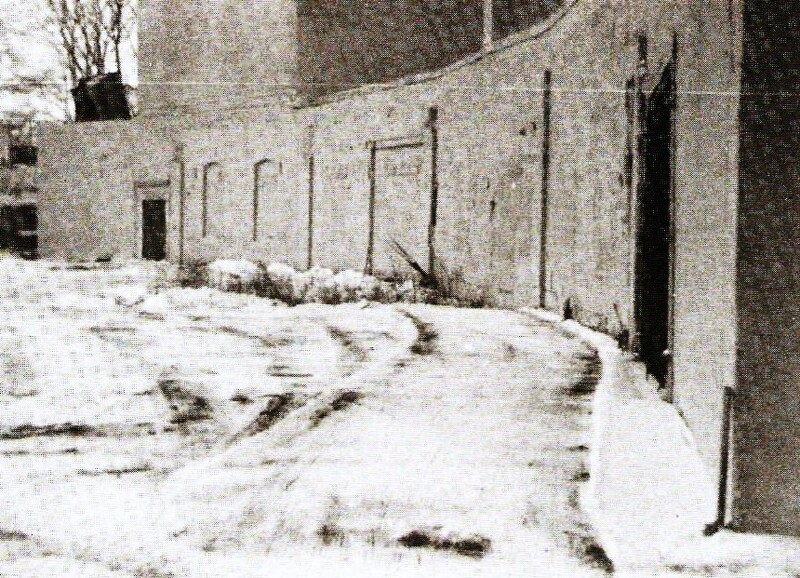 These shots are prior to the roll-back of the YMCA in 1920 and possibly go back to 1905 for the upper, and 1907 for the lower photo, based on the Conn. Co. logo seen on the cars. 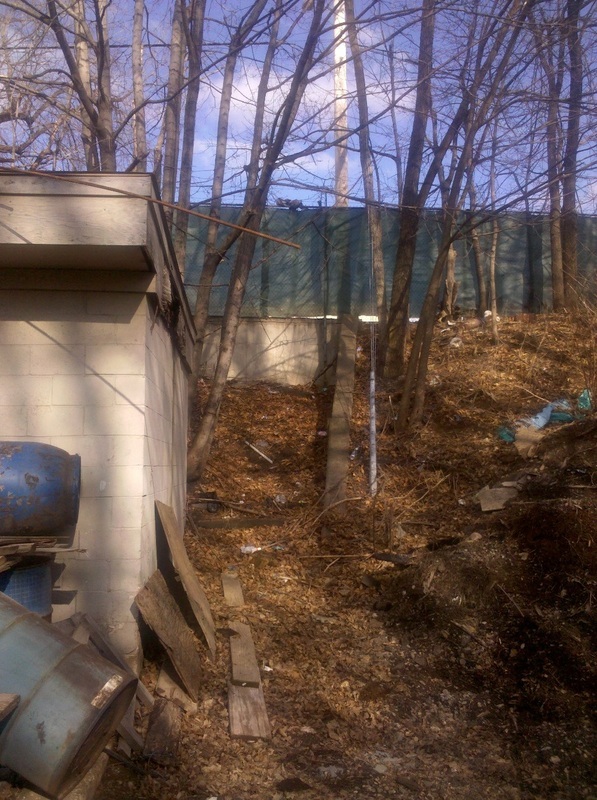 [4.13] This is an eastward-looking view of the rear of the RR YMCA with the Silver St. yard behind it. The negative has been corrected from the reversed printing in our original NH&D history published in 1981 [SL12.4.13]. There is a glimpse of the GOB across the street around the north end of the structure. 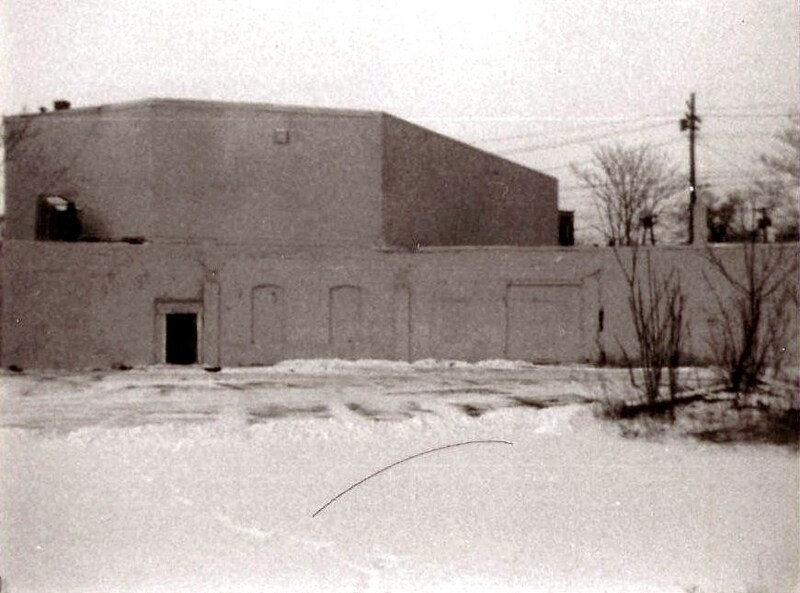 The single story extension on the back, possibly the train-access area for passengers in the NH&D/HRR era, was converted into the YMCA's bowling alley. The Connecticut Co. car parallel to the rear of the building dates the shot to ca. 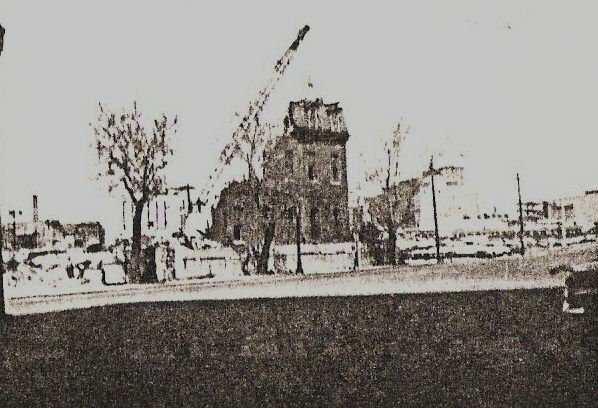 1920 or later, after the structure was moved backward. See MP 4.14 below and Track 6, MP 6.8. 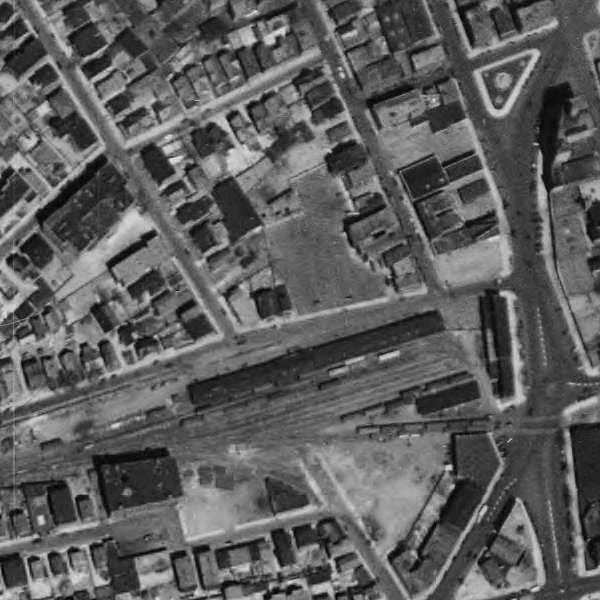 [4.14] The aerial map shot shows the new alignment of Commerce St. as the approach to the 1920 station, which is just out of view in the lower right. It also shows how the old NH&D freight wing has been moved west to make room for the backward shifting of the YMCA. The space left in between was cleverly used to run a track along the back of the YMCA curving around with ladder tracks to reach Silver St. and Freight House C. The trolley express operation was relocated to these quarters possibly as early as 1914 before the street changes. The old NH&D freight house wing and platform were subsequently used for warehousing produce. 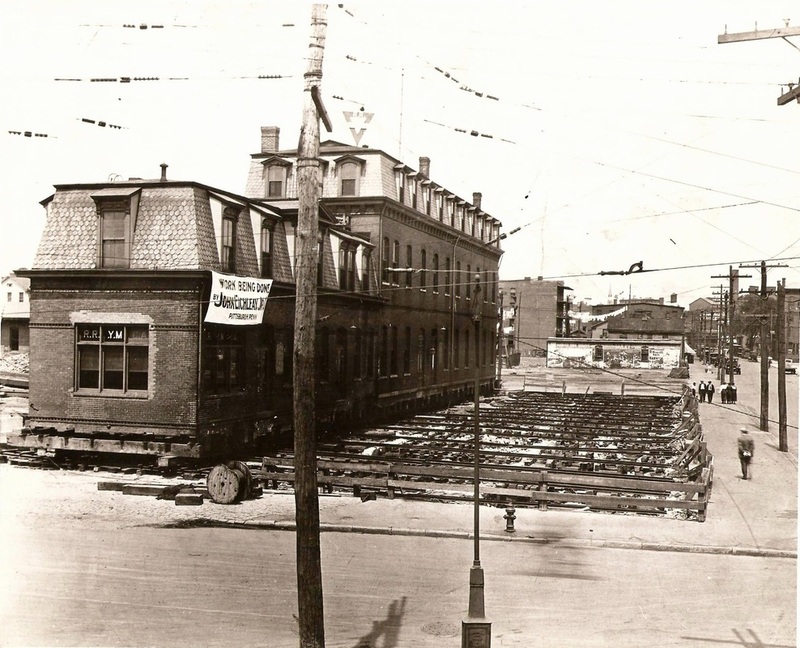 The val photo at left, dated 4/15/1927, shows the space between the two-story 1878 portion of the YMCA and the freight house with the 'Produce' sign to the left. 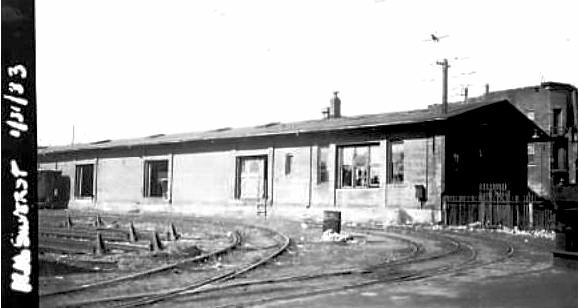 [4.15] A 1/31/1933 view of the east end of Freight House C in the Silver St. yard. 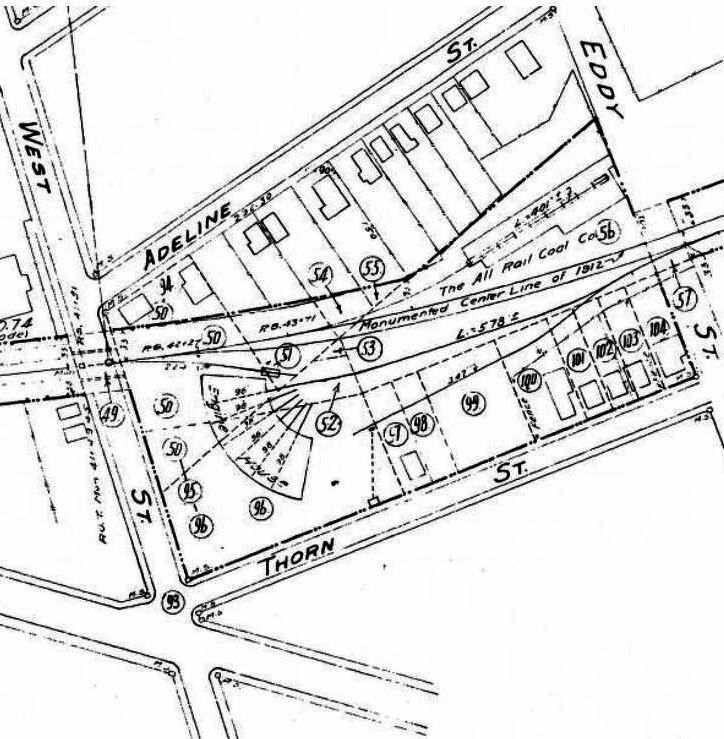 Notice how the yard tracks have been dead-ended farther west and the ladder tracks come around the back of the YMCA and fan out to the freight house. 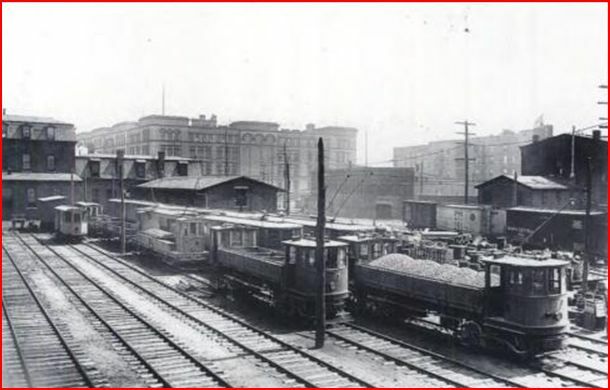 [4.16] A 1925 view of the west end of Freight House C in the Silver St. yard. 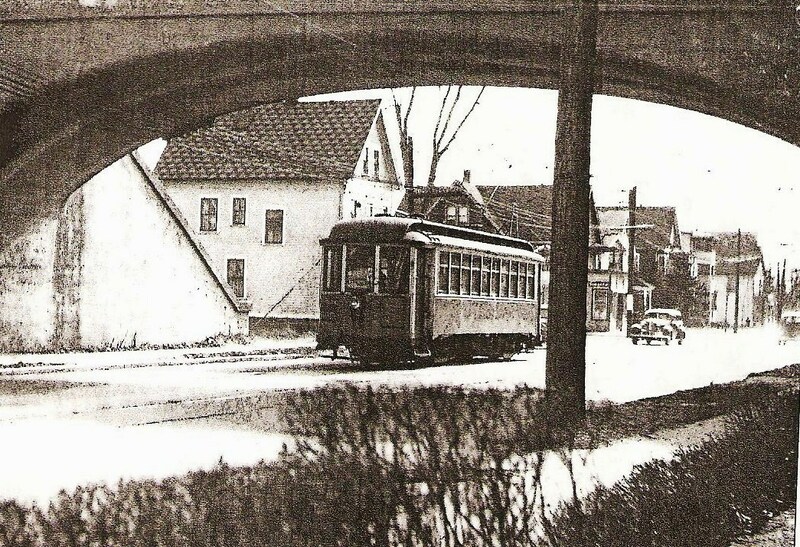 Note the end-door opening on the Conn. Co. trolley express car to facilitate freight loading. [4.16.3] This is a street-level shot of the Howard Ave. bridge over the NH&D ROW, looking east toward the Cedar St. and Liberty St. bridges and the Silver St. yard. 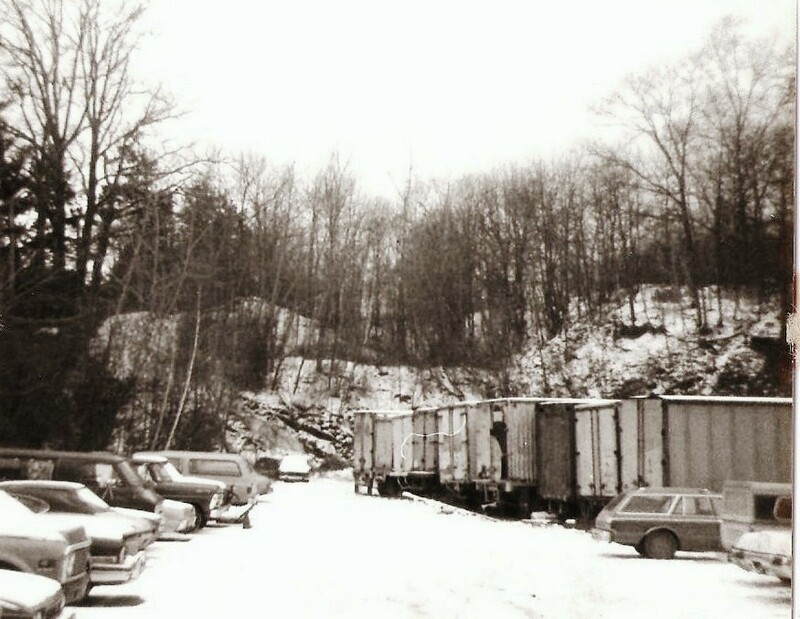 The yard and the old NH&D station were not all that long gone when we took this shot in the late 1970s. It looks like chain-link fence has already replaced the older railings between the buldings. 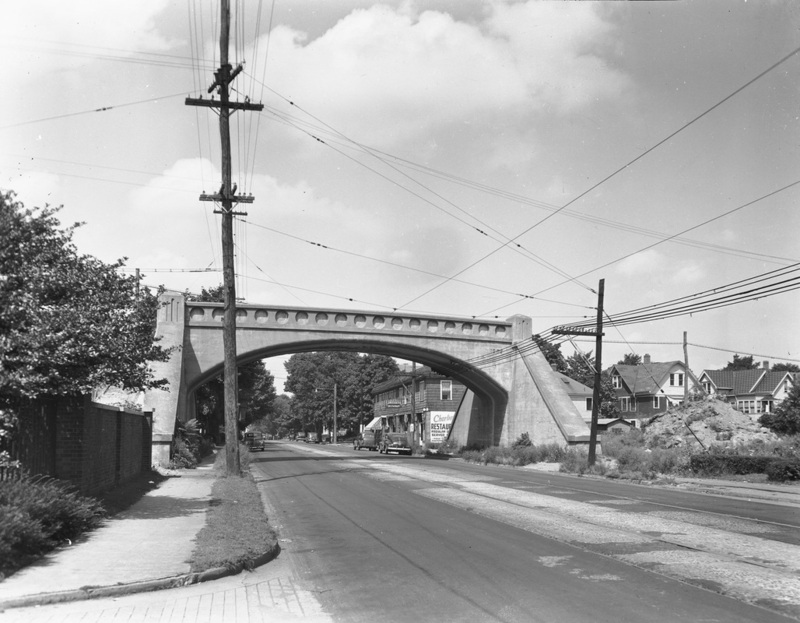 A few years later, when Conrail would not clean up the trash in the cut below these bridges, the city bought the right of way from the Boulevard to Cedar St. for $5,000, and filled and capped most of it at a cost of $300,000. Lee H.S. and public housing were built on some of the resulting land [NHR/09/27/1980/?? ; NHR/01/23/1981/??]. 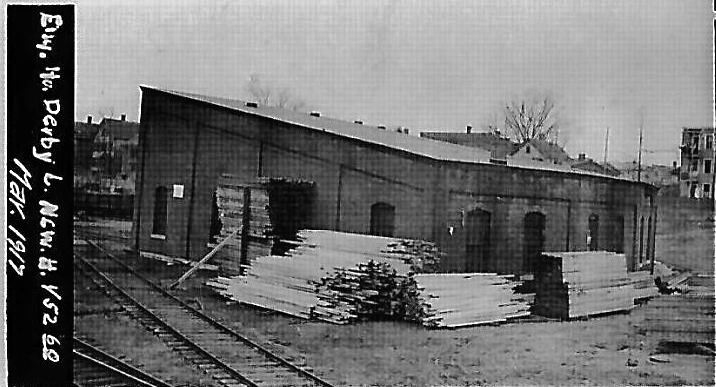 [4.17] Pursuant to the stipulation in the sale agreement that the NH&D confine its operations to the west of Meadow St. and with the increase in business that followed the HRR lease, the NH&D built a roundhouse at Thorn and West Sts. in New Haven. Work was reported to have begun late in 1889 when the Derby road asked the city to remove drains on the property so they would not interfere with the construction. 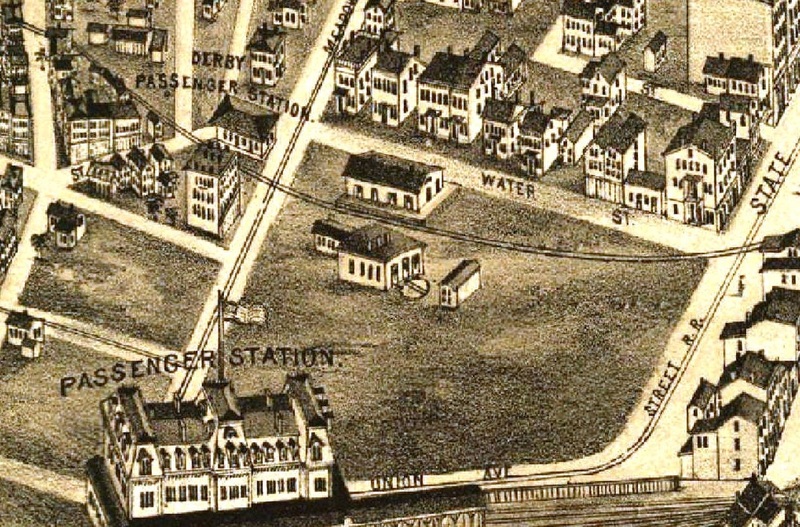 The facility was put up as a four-stall structure, as evidenced by the 1911 map at middle left. By the June, 1915 val map at lower middle, it has become a six-stall facility. Though we have not yet seen mention of this renovation in newspaper accounts or company records, the March, 1917 front and back val photos in the top row bear this out. 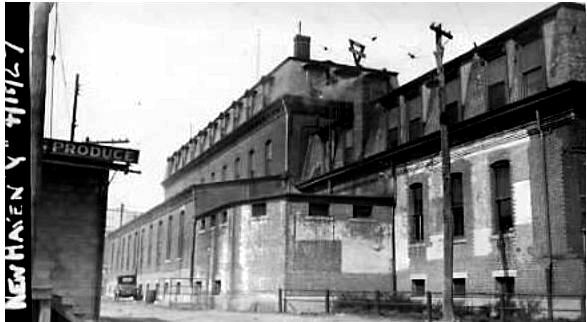 The image at left shows the rear view from West St., the facade that was kept as the front of the subsequent structure: see below. The shot at lower left shows engineer Thomas Quinn on the turntable in HRR No. 33. The number is seen on the side of the headlamp. The engine appears to have just emerged from the last stall, the south corner of the roundhouse visible behind the tender. The fireman is Harry Merwin in the photo that likely dates to between early 1890 when this roundhouse opened and 1892 when the HRR was leased by the NYNH&H. The same image appears in Lines West, with the engine mislabeled as No. 39 in the caption. 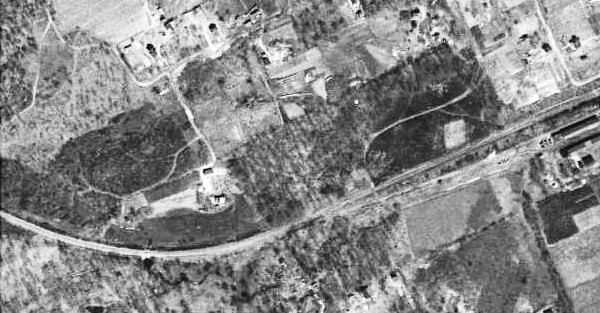 At lower right is the 1934 aerial map view of the roundhouse site. 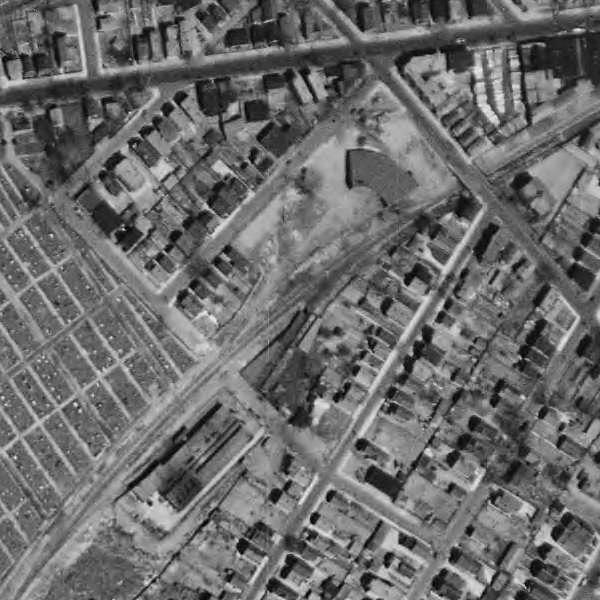 The level, rectangular plots seen above the track on the left are the eastern portion of St. Bernard's Cemetery. [4.18] These unique and rare artifacts are a treasure trove of information about NH&D/HRR operations in 1890! They are the prized possessions of Mary A. Hoyt, granddaughter of Harry Merwin, the fireman who is pictured in the cab in the photo at lower left in the previous entry. Assuming the conductor's report correlates with that photo, this is the same No. 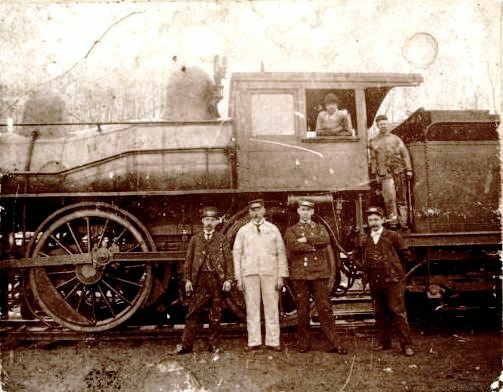 33 locomotive seen in our previous entry and engineer Tom Quinn is standing to Merwin's left. The hats and their features do appear to be a match for both of them. On the ground are the remaining four crew members: H. S. Beers, conductor, whose name appears appropriately ahead of the others on page 1 of the report and who is probably seen on the right; J. Hovey, baggageman, probably with the white outfit; and M. Quinn and W. Marshall, brakemen, with their matching uniforms, on either side of Hovey. Of these men, only Herbert S. Beers is familiar to us, pictured also on Track 5, MP 5.17.1 though seemingly bearded there. 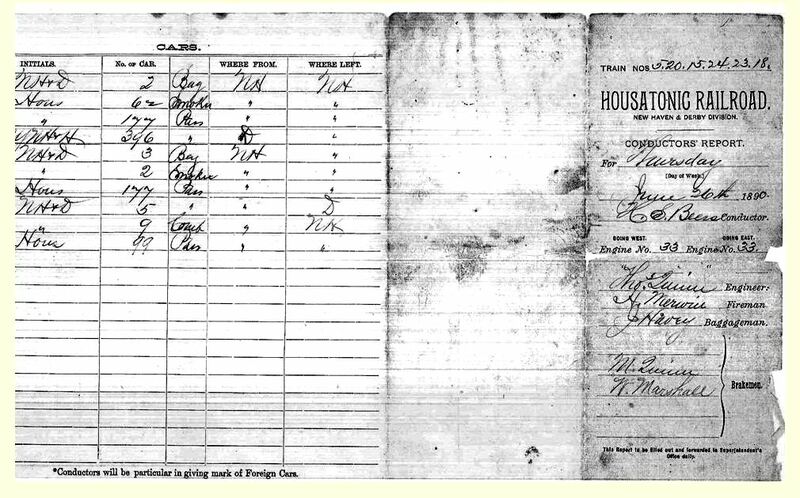 Interior pages 2 and 3 show that this crew and this engine will be operating six trains in the course of Thursday, June 26, 1890. It is exciting to think that this assortment of passenger, baggage, smokers, and one combination car listed on page 4 are a 10-car consist that will travel back and forth all day and. With 50 trains per day coming into New Haven by this time, this larger consist may have been an exception to the three-car locals often pictured on the Derby line. Note that some of the cars are NH&D, some HRR, and there is a single NYNH&H passenger car, no. 396, being handed over at Derby (Jct.) from its Naugatuck Division for delivery to New Haven. The interior pages of the report show the train roster and activity for the day, alternating through the three westbound trains on the left and the three eastbound trains on the right. Train 5 is the crew's first run of the day, leaving New Haven at 8:10 a.m. and arriving in Ansonia at 8:40, making all stops. The consist leaves as train 20 at 9:08, arriving back in New Haven at 9:38. Next out it is train 15 leaving at 10:00 and arriving at 10:26 in Ansonia, turning around as train 24 at 11:42, making all stops and arriving in New Haven at 12:15 p.m. With probably a break for lunch, the crew leaves New Haven as train 23 at 1:43 making stops at Derby (Jct. ), Shelton and Stevenson, arriving at Botsford at 3:50, returning at 4:57 as train 18 and arriving back in New Haven at 5:53. 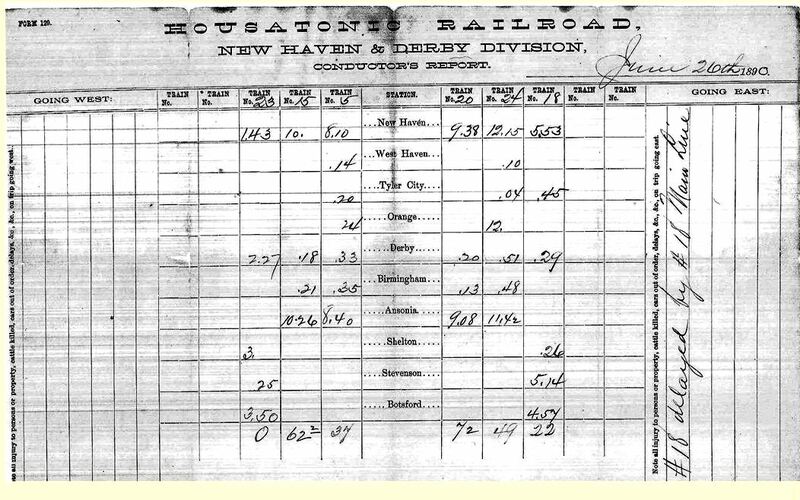 It is worth noting that this is an all-passenger train, which the NH&D began running in the Housatonic era, and the figures at the bottom of each column may be the numbers of passengers carried, train 23 being empty and train 15 perhaps carrying 2 children represented by the small underlined numeral. Conductor Beers notes that train 18 was delayed, perhaps meaning by engine No. 18 at Botsford, on the main line from Bridgeport. Many thanks to Mary Hoyt for her permission to showcase these priceless materials on TCS. The data here is also entered on Track 3, MP 3.6.2 where we have rosters of personnel and equipment. [4.19] The first four photos were taken in the 1980s and the last two in 2012 on a recent visit to PJ's Construction Co., the current tenant in this commercial structure. While we had previously thought that the entire roundhouse had been preserved, only the rear wall was retained as the front of a newer building and it has been masked by a more recent addition ahead of that also. The top shots show the front of the building as it used to look and the middle shots show the West St. overpass. 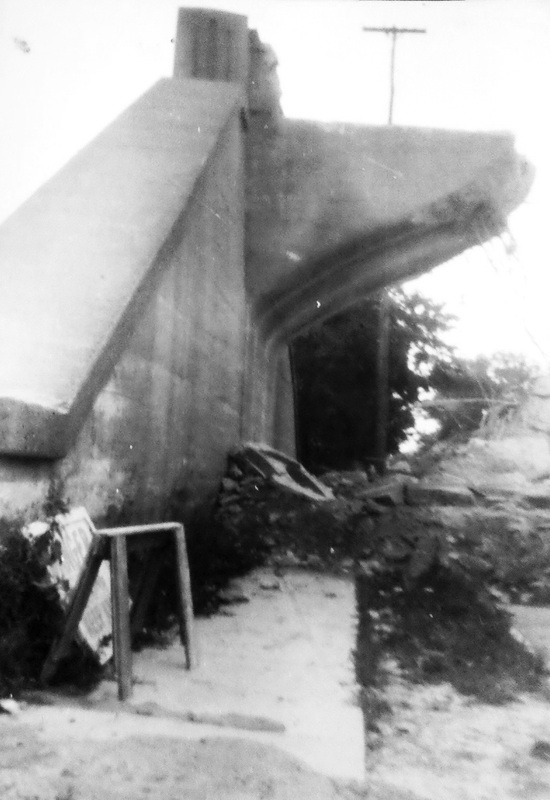 That flimsy structure looks more like an 1871 NH&D bridge than something in 1980. The lower left shot looks toward the filled-in bridge where the ROW once continued east. In the interior shot at lower right, a bricked-in window in the concave 1890 rear wall, that is now within the present structure, can be seen. [4.20] This is most likely an eastbound train on the NH&D's 1871 West River trestle heading into New Haven, at a pretty good clip judging by the snow being kicked up! 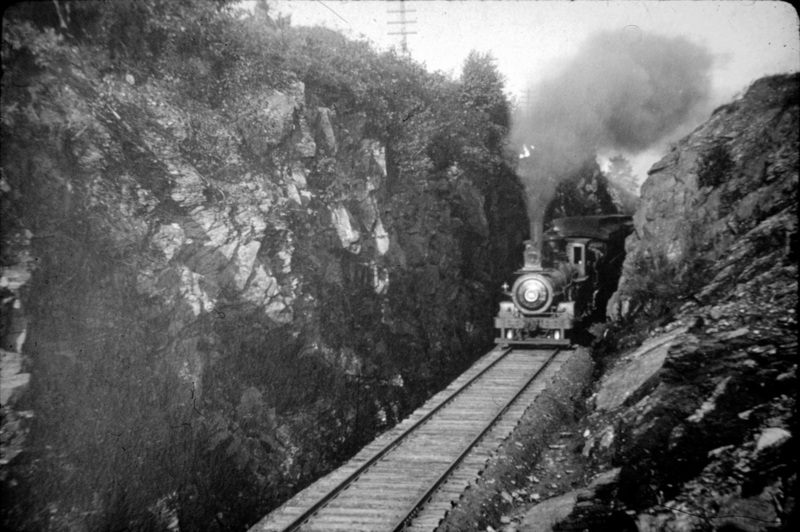 If the direction of travel is correct, this picture predates the NYNH&H's 1892 West River branch [NHER/10/27/1892/03] that would curve to the south (engineer's right), just about where the train is, cross to the river's east side and thence along it and into Union Station. Closer scrutiny of the engine might give us a better idea, but this looks like the Housatonic era, 1888-1892, with the train headed for the new NH&D station on Commerce St.
[4.21] In the foreground are the pilings for the trestle that the train is on in the shot above. This was abandoned on January 15, 1938, along with the line from just west of here to Orange center. 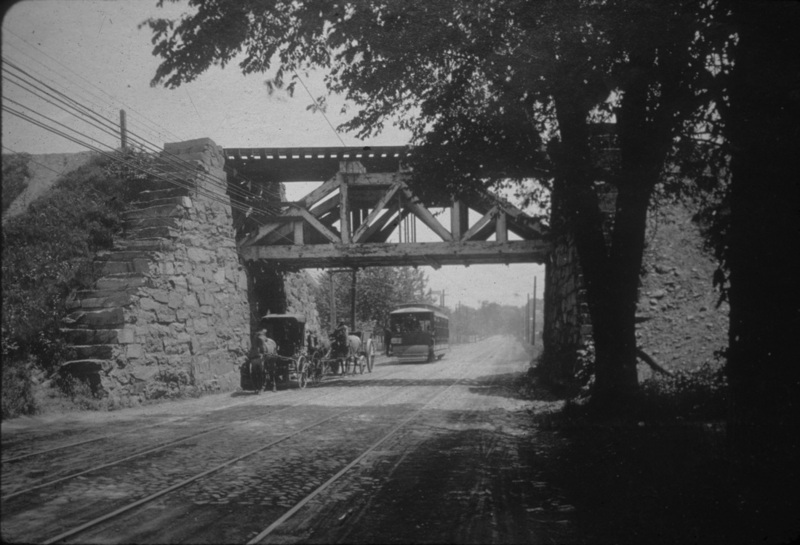 The trestle still standing was the NYNH&H's 1892 connector to Union Station. 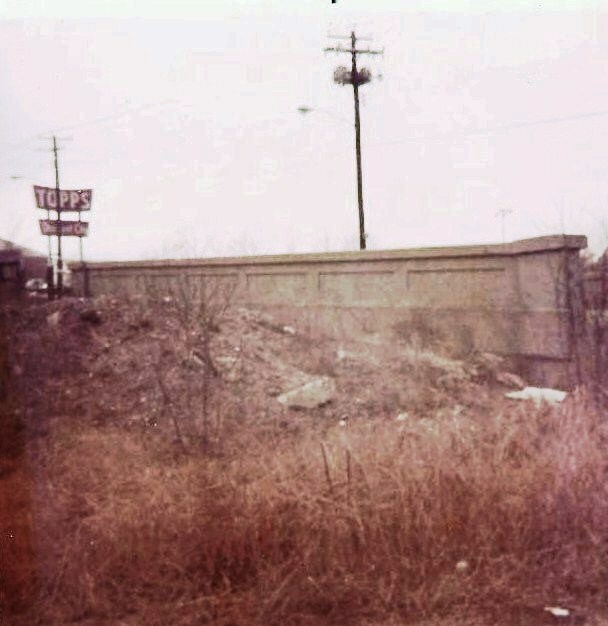 Track to reach the rendering company that was located just west of the river was left in place possibly as late as the 1970s, but was presumed gone when this picture was taken in 1978. 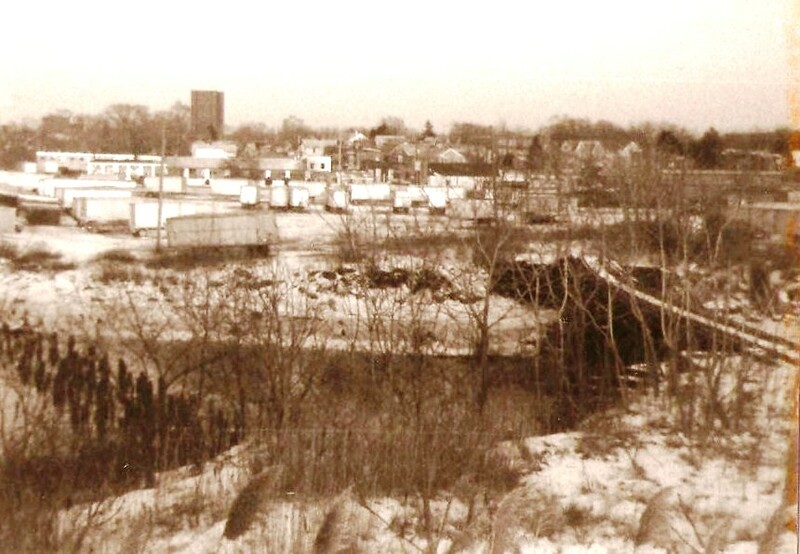 On September 26, 2001, the trestle seen here, which had collapsed into the river at some point later, was removed through the activist efforts of New Haven mayoral candidate Joel Schiavone. 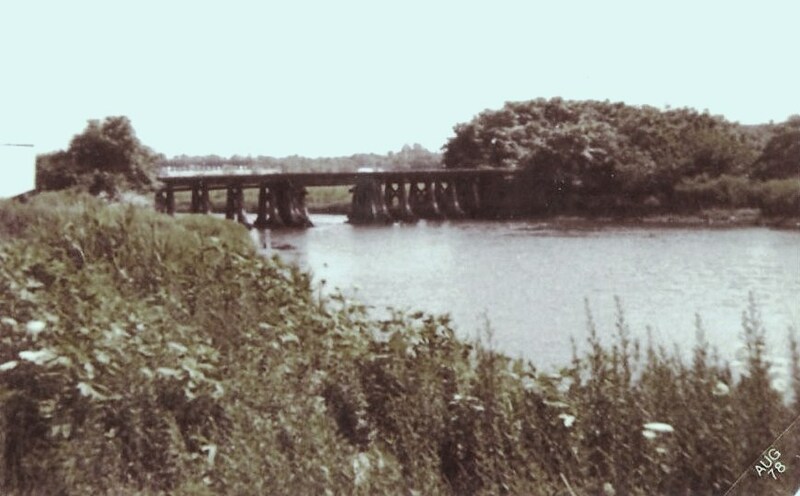 [4.21.1] Two more views of the West River crossing from the early 1980s. The one on the left looks south, with high tide covering the pilings for the 1871 NH&D trestle. We must have been standing on the bluff to the west to take the right 'aerial' shot which looks back toward downtown New Haven. 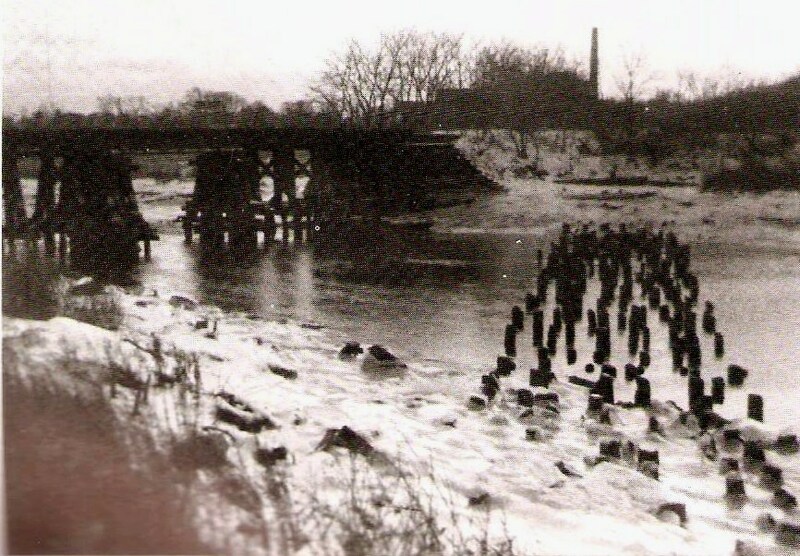 The pilings are visible in the river as is the 1892 trestle curving south to go to Union Station. In the far distance, the 1969 Knights of Columbus tower can be seen on the left and to its right is the NYNH&H's 1947 headquarters building. This detour will briefly take us off the NH&D main and back to the Meadow Street Union Station via the 1.66-mile connector that the NYNH&H put into use late in 1892. 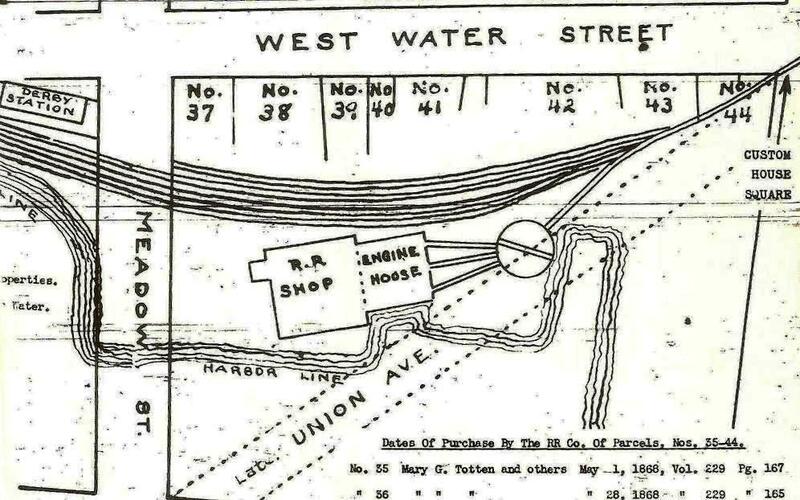 [4.22] The 1892 New Haven city directory map shows the West River Branch connector installed by the Consolidated late that year to bring trains from the newly inaugurated Berkshire Division into Union Station. The Derby line track to the east was cut back to Meadow St. at the same time. 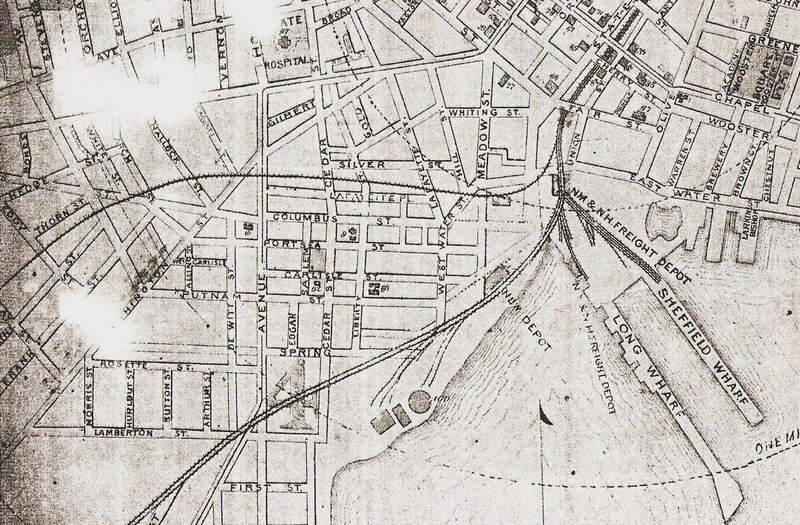 The east leg of the wye was added here soon after to give better access to the Derby terminal yards along Silver St.
[4.22.1] This shot shows the Washington Ave. bridge in New Haven, a point located in the middle of the map above. 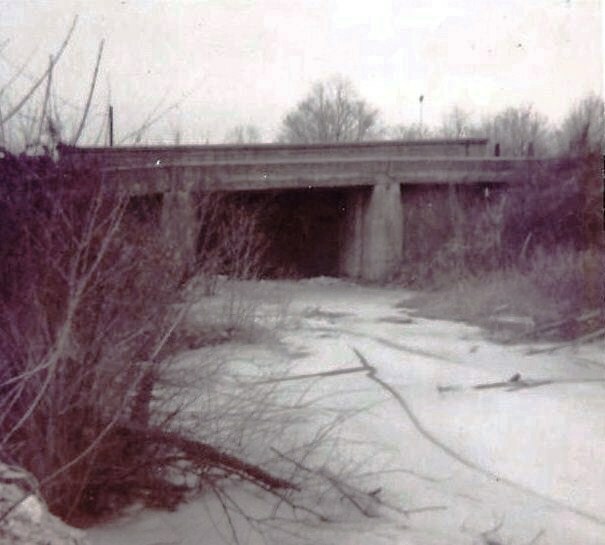 The bridge was ordered by the railroad commissioners in 1892 [RRC31.493+] when the West River Branch was opened, though we think it was not built immediately. 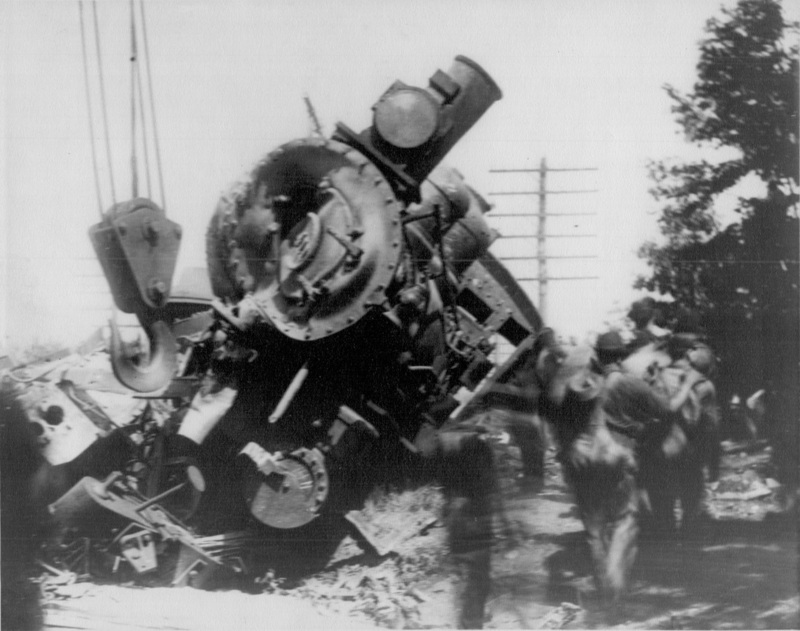 These photos were taken with the annual inspections the PUC performed as they took over the duties of the old Board of Railroad Commissioners in 1911. By the 1920s, these tours included the taking of pictures in all four directions at each public railroad crossing and examining all the bridges for structural condition and height. Some pictures show the commissioners using a 'story stick' to measure the clearance to make sure it conformed with commission specifications. The photos were pasted into notebooks that were later discarded and ultimately came into the hands of Max Miller, to whom we owe an inestimable debt of thanks for recognizing their significance and preserving them. The notebooks also contain crossing diagrams and bridge information that was updated when changes were made by the railroad, often per order of the commissioners to address safety concerns. 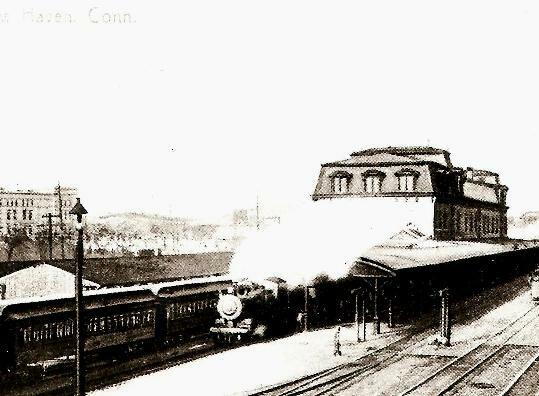 [4.22.2] This photo, though murky, shows trains on the Derby tracks at the west end of the 1875 New Haven Union Station. 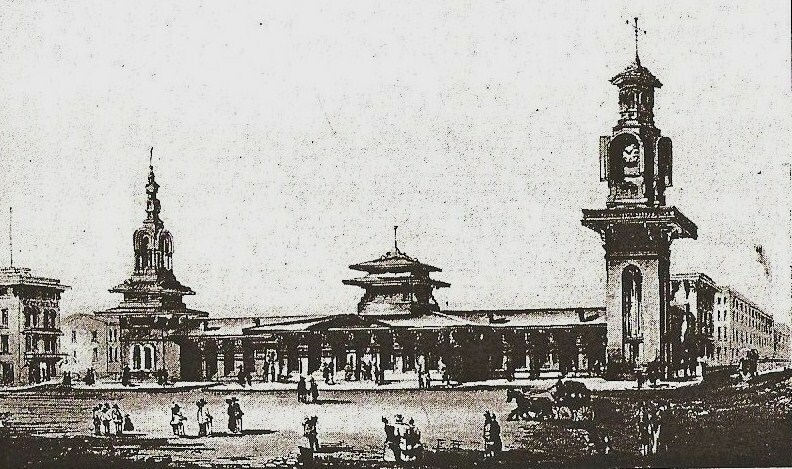 This is sometime after the 1894 opening of the 'Yellow Building,' the new General Office Building, which is visible to the far left, and appears to be prior to the 1913 electrification that would put poles, later catenary towers, into the picture as seen in the next item. 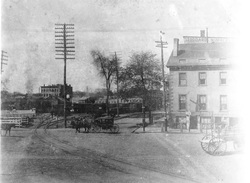 [4.23] In this panoramic photo of the west end of the Meadow St. station, the tip of the General Office Bldg., which opened on January 1, 1894, can be seen all the way over to the left, beneath the white semaphore signal blade. The wooden poles being put up in the photo's foreground are thought to be for wiring prior to the catenary towers that would complete the electrification of the New York Division. That would probably date this photograph to 1913. The photo on the right is a close-up, showing where the pocket tracks on either side of the platform were designated as the terminus for Derby locals and Berkshire line trains. [4.24] This is the view going west out of Union Station toward the West River Branch, which is the right-most, fifth track in this 1978 shot. A New Haven-bound Metro-North train approaches on track 4. 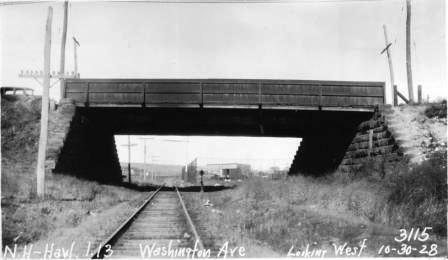 The bridge over the tracks was a pedestrian footbridge connecting Grant and Morris Sts. [4.25] Resuming the Derby main at the West River going toward Ansonia, we cross into what was the town of Orange until its West Haven borough was made an independent township in 1921. 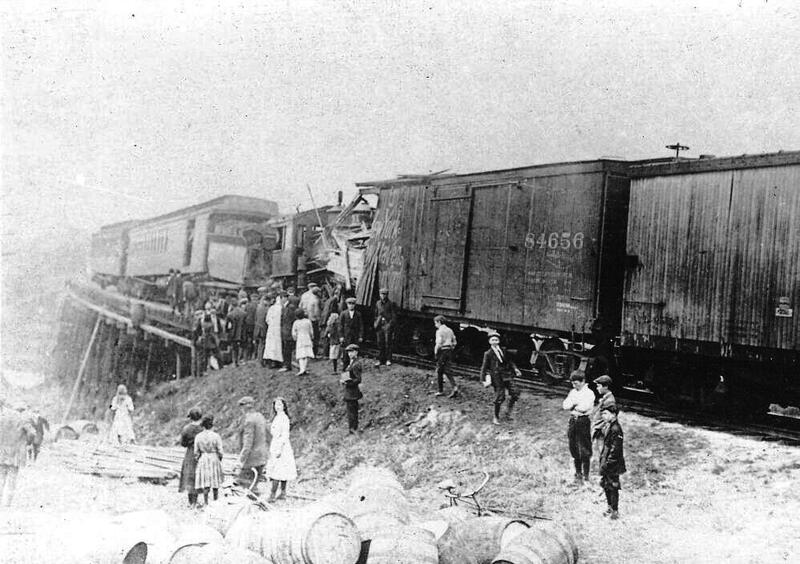 Merwin's slaughterhouse was located just west of the river and Merwin's siding was the scene of a serious wreck in 1912. [4.26] The arrow shows the location of the accident on this 1892 USGS topographic map. The map also reflects the completion of the wye with the east leg installed allowing trains to back from here into Union Station or vice versa to reverse direction. This was apparently easier than running the engines through the yard downtown and turning them there. The June 4, 1911 timetable lists 12 daily and eight Sunday trains each way, including the two daily Berkshire line trains each way between Pittsfield and New Haven. 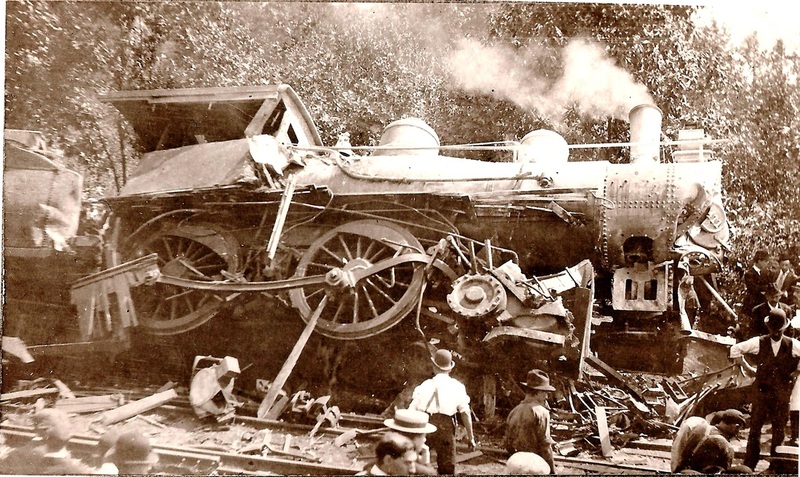 [4.27] Engineer Thomas Quinn, whom we have already met, was in the cab when a string of boxcars was backed out of the siding onto the main in front of him. 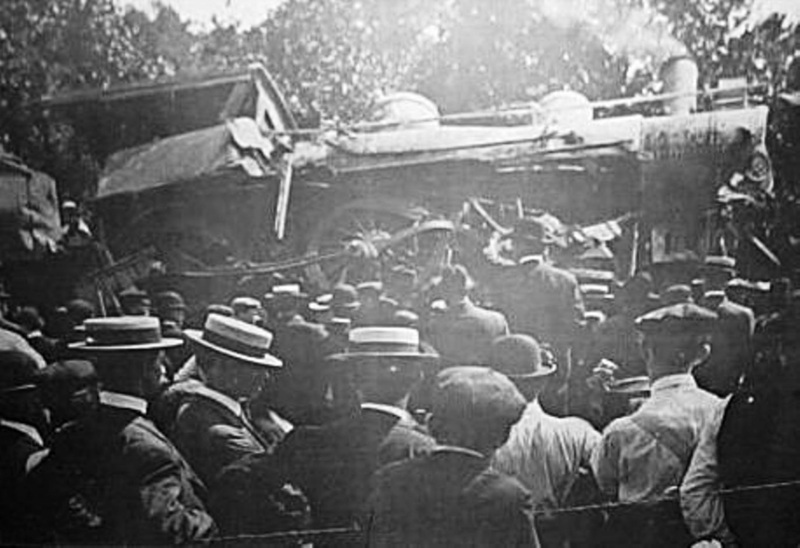 He is credited with saving the lives of his passengers by sticking to his brake lever in this accident on October 14, 1912. See NHRHTA Bulletin #11 (February, 2003), for a New Haven Register story by William J. Prendergast about Thomas Quinn through the eyes of his son, William N. Quinn, who supplied these photographs. 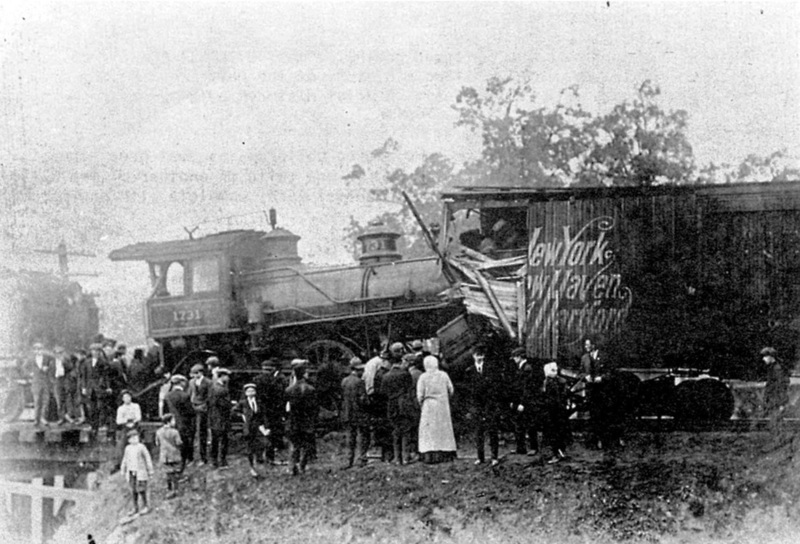 [4.28] The caption for this picture in Lines West says that a string of boxcars was backed out onto the main in front of the morning local from Derby to New Haven. On closer inspection, it appears that the 1731 is coming off the West River trestle, which would make this the morning local to Derby, not to New Haven. Looking at the valuation map below, the only way the 1731 could have hit the rear of the box-car string in this manner is if the 1731 was going toward Derby. [4.29] The right arrow on the 1915 valuation map is the siding switch where the boxcars were backed out. Click here for the entire map section. The Merwin's plant, south of the Derby main, appears to have evolved into the New Haven Rendering Co. by 1915, if that was not its official name all along. 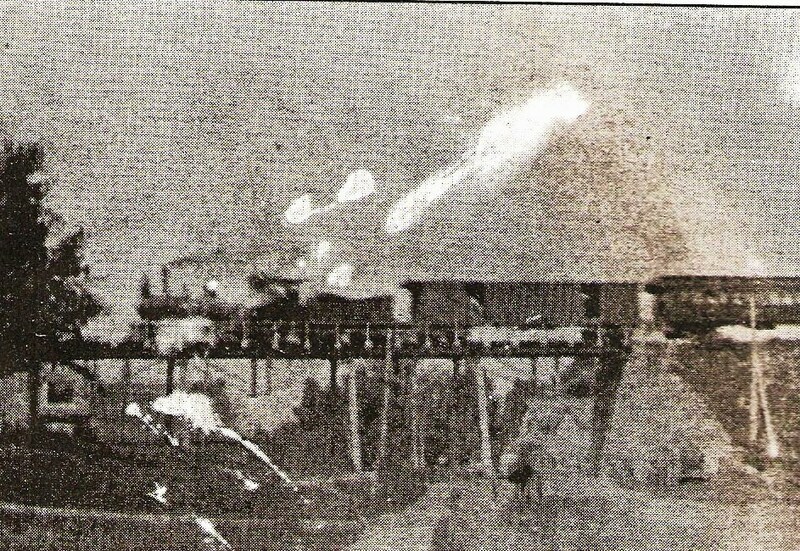 The left arrow is at the point of impact at the river trestle as shown in the first picture. The fact that the long trestle is straight behind the Derby local must mean that it was backed out to the West River wye to reverse direction and it proceeded forward across the river. The short distance to the point of impact argues for poor visibility that morning. [4.30] This map is from the 1891 Price & Lee New Haven city directory. 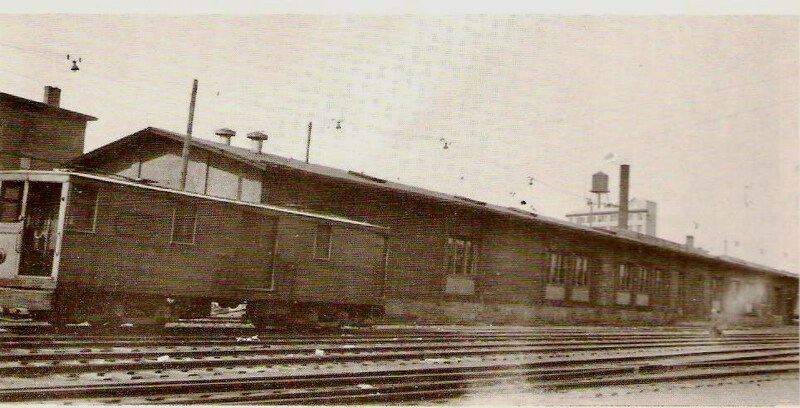 It shows the depot for West Haven, also known as Allingtown, at the northwest corner of Front and Railroad Aves. 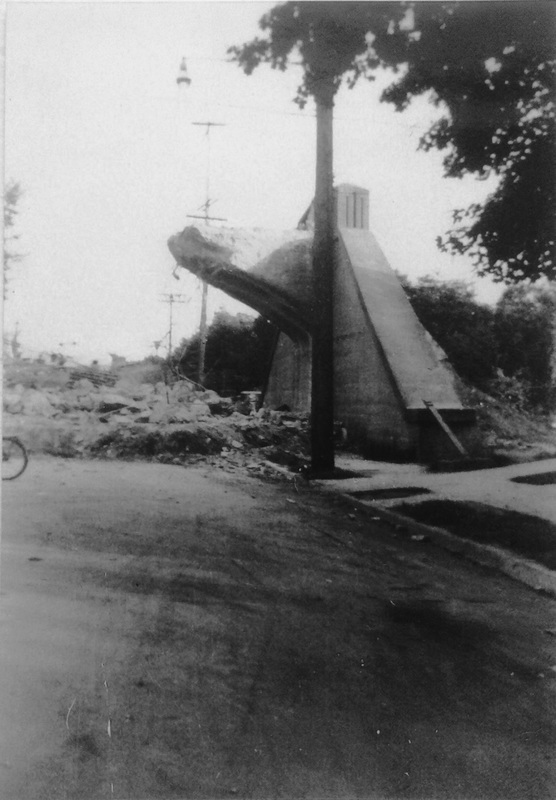 The line was elevated at this point and the station was presumably at street level. No photos of this station have been identified. The NYNH&H shows as double track on lower part of map. By the middle of 1892, the NH&D track would also be labeled as NYNH&H and would belong to the Consolidated with its takeover of the Housatonic RR and its leased lines. [4.31] This shot corresponds to the view on the map above. It shows the crossings of both First Ave. on the right and Campbell Ave. on the left. The filling of the old trestlework under the line was probably done prior to the 1892 lease and, if not, was finished thereafter by the Consolidated along with the improvements of 1909 (see below). That work most likely took out whatever remained of the station at Front Ave. where no signs are seen by this time. Passenger service on the line ended in 1925. The northeast corner of the VA hospital property is seen on the lower left. 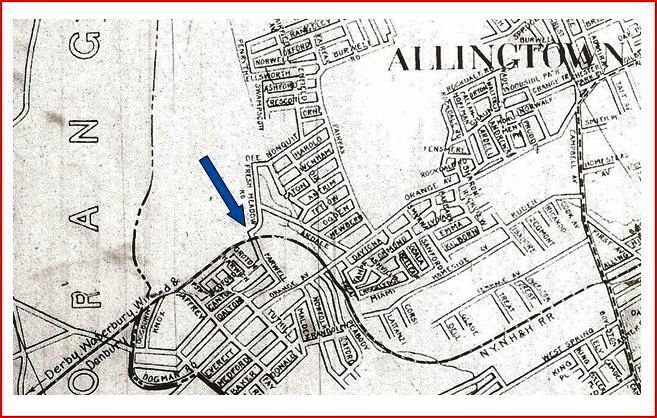 [4.32] An early NHD&A engine crossing what was then variously called Fourth Ave, Allingtown Rd., or West Haven Road. By 1874, the thoroughfare would be known officially as Campbell Ave. to honor the British army adjutant who saved the life of a West Haven minister only to be shot later himself during the British invasion of West Haven in 1779. Note the primitive early construction on opening in 1871 with the rough-hewn stone abutment and spindly wooden trestle. One can't be completely sure but this train is probably heading to New Haven having just come through the Allingtown cut and onto trestlework that extended almost all the way to the West River. The bridge would be upgraded later and the trestlework filled in. 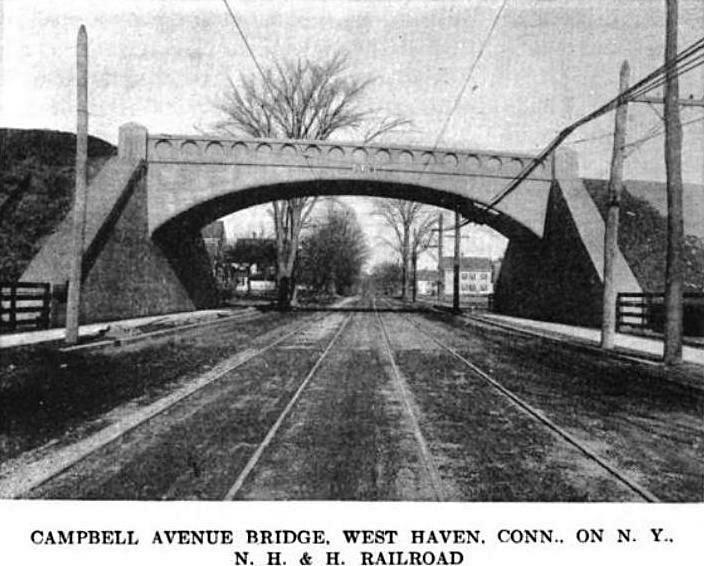 [4.32.1] This is the later bridge over West Haven Rd., now Campbell Ave. There are solid stone abutments on both sides of the road, a sturdy wooden truss bridge, and filled embankments replacing the trestle work. Comparing the electrical wires in the shot below, the buggies and the trolley are likely heading south, making this a view to the north. This bridge may have been built in 1875-1876 when the NH&D spent nearly $24,000 for infrastructure improvements including bridges [CRC 23.1876.208]. New abutments, "at the Allingtown highway bridge," likely the ones seen here, were put up in 1881 [CRC29.1882.34]. The overhead trolley wire indicates that this scene is after the New Haven and West Haven Horse RR went electric in July of 1892 [NHER/07/07/1892/01], about the same time as the double-tracking [NHER/11/25/1892/04], so this shot has to be between then and the 1909 bridge replacement by the NYNH&H. A spokesman at the Shore Line Trolley Museum [click here] says the streetcar looks like a ca. 1901 Brill, 12-bench, two-truck, open car similar to the museum's 15-bench #614. A clearer look at the signboard on the car might narrow the 1901-1909 time frame somewhat further. [4.32.2] Many thanks to Ellen and the gang at Marshall's Garage for contacting Morgan Dunnigan so we could have this historic photo. 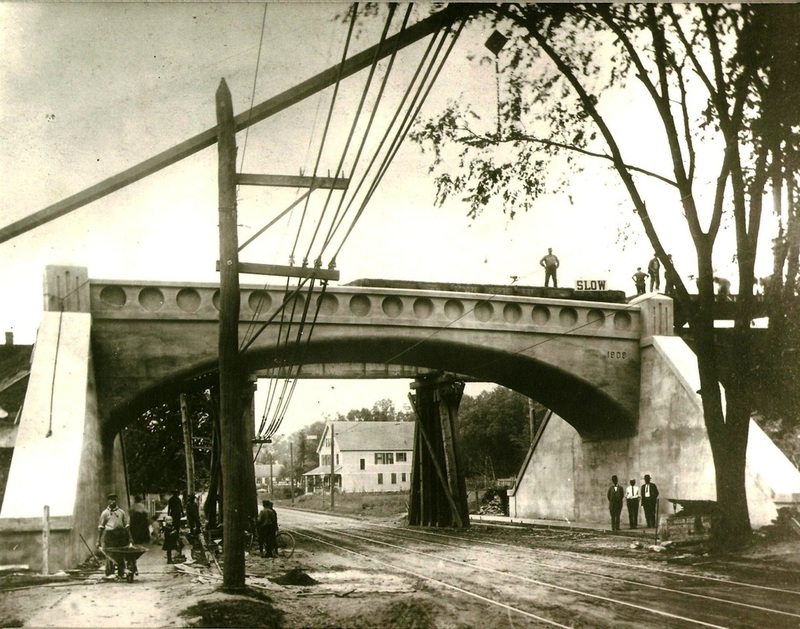 Work is being completed on the impressive concrete bridge in September of 1909. The older truss bridge has been removed and, if you look closely under the arch, you can see the temporary fly-around bridge standing on wooden pilings just behind it. Note also the 'Slow' sign above what is probably the roofline of a construction car on the new bridge and the busy workers on the flat car to the right. 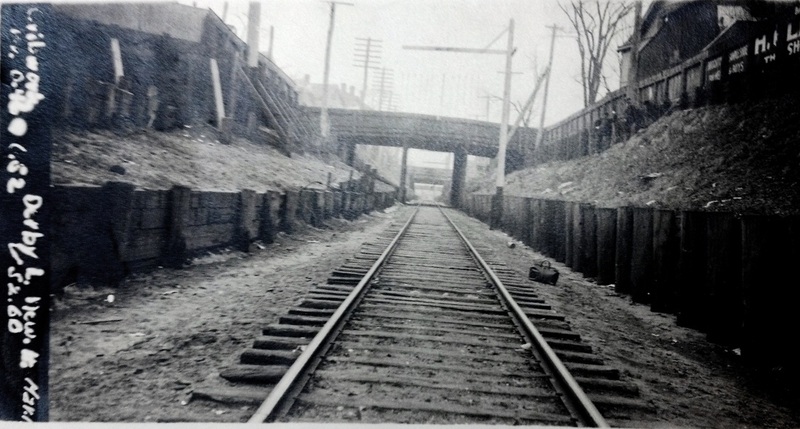 The view looks north up a still-primitive Campbell Ave. that carries the double-tracked trolley line, operated since June 1, 1907 by the Connecticut Co. These upgrades to the busy Derby line came at a time when there were still a dozen or so daily passenger trains each way, including two to Pittsfield on the Berkshire Division. Additionally, NYNH&H Symbol Book No. 4, in effect June 5, 1910, shows a single weekday, way freight leaving New Haven at 9:15 p.m., arriving at Derby about 10.00 p.m., leaving Derby at about 10.15 p.m. and arriving back at New Haven about 10.45 p.m. Thanks to Richard Fleischer for the freight traffic info. [4.34] This is a view looking south with Connecticut Co. streetcar #861 approaching on Sunday, February 2, 1947, about a year before trolley service ended in Connecticut, with the New Haven area the last bastion. The house with the four windows still stands in 2015 on the east side of Campbell Ave. across from Marshall's Garage. This photo appears in New Haven Streetcars [p45]. Our thanks to BERA and to Mr. Koella for permission to use this photograph. [4.35.2] This shot shows the 50-ft-deep Allingtown cut, just west of Campbell Ave, the scene of landslides, fallen boulders, and stalled NH&D engines on the westbound up-grade in the early days. After grueling lessons in photography, astronomy, and locomotive technology, we think it is virtually certain that the train is eastbound. When we flipped the negative horizontally, the knuckle on the coupler was, incorrectly, on the engineer's left. As seen here, the train could still be traveling west except that the sun in our northern hemisphere can only be in the southern sky, casting the locomotive's shadow perpendicularly to the north. Of course, in the words of the old 1930s radio show, only "The Shadow knows..." for sure! The pole line is probaby not as good a clue as we first thought. The photo at MP 4.47.1 shows pole lines on both sides of the NH&D track ca. 1900 and we know that SNET and AT&T lines ran on opposite sides of the NH&D: see Track 6, MP 6.5.1. The engine number seems to read 98. The widest date range of the shot is from 1900 to September of 1904, the former being the date when automatic couplers began to appear on locomotives and the latter when NYNH&H engines were renumbered, the #98 becoming the #1796. The cowcatcher on this locomotive has been replaced by a foot board, indicating it was a yard engine that may not have routinely pulled Derby line passenger trains. That makes this shot doubly interesting, unique, and historic. 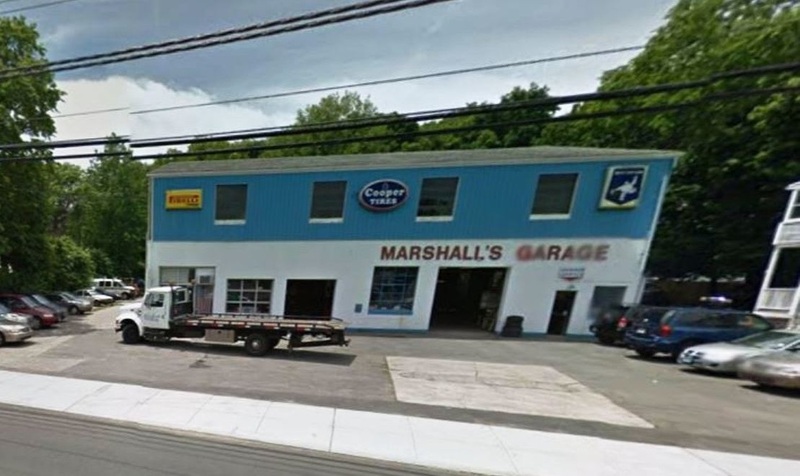 [4.35.3] With the embankments cut down to ground level, the land just west of the 'Great Concrete Bridge' on Campbell Ave. became the site of Marshall's Garage. The scene looked like this ca. 1980 and still does pretty much today. Beyond the parked trucks, the eastern end of the Allingtown cut is visible in the distance and the level of the ridge shows where the track once was. The right of way enters the VA hospital property at that point. [4.36] The Derby line is running through the VA hospital property, just to the left (north) of the power plant smokestack. There is a bridge in the center over the track to facilitate access to the upper part of the property. The structures seen there are temporary wards built in 1919-1920 for soldiers returning from The Great War, WWI. This view looks east toward Campbell Ave. In the Derby road's early years, there was a tuberculosis sanitarium here and it is said that passengers would close the windows on the trains as they were coming through here for fear of contracting the illness. [4.37] This shot shows the area just west of the VA hospital property in West Haven. The Allingtown siding is barely visible at this magnification. The switch was just east of the big curve. 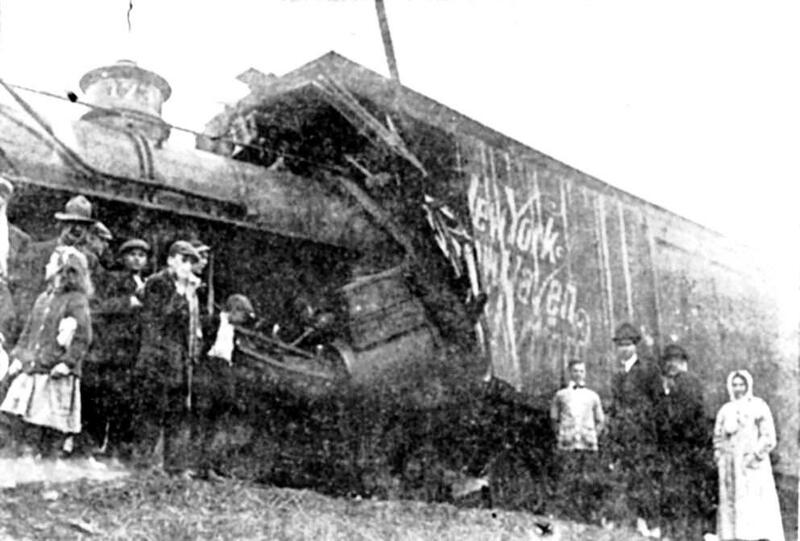 The siding was the scene of a famous wreck on September 15, 1907 involving engineer Phil Blakeslee, author of Lines West. [REFS: HC/09/16/1907/01; NHER/09/16,17/1907/01; SR/09/16/1907/09][rev032316]. [4.39] This is the Allingtown siding from the valuation maps. Click here for entire map section. The entrance to this double-dead-ended siding was from the east at the upward-pointing arrow. 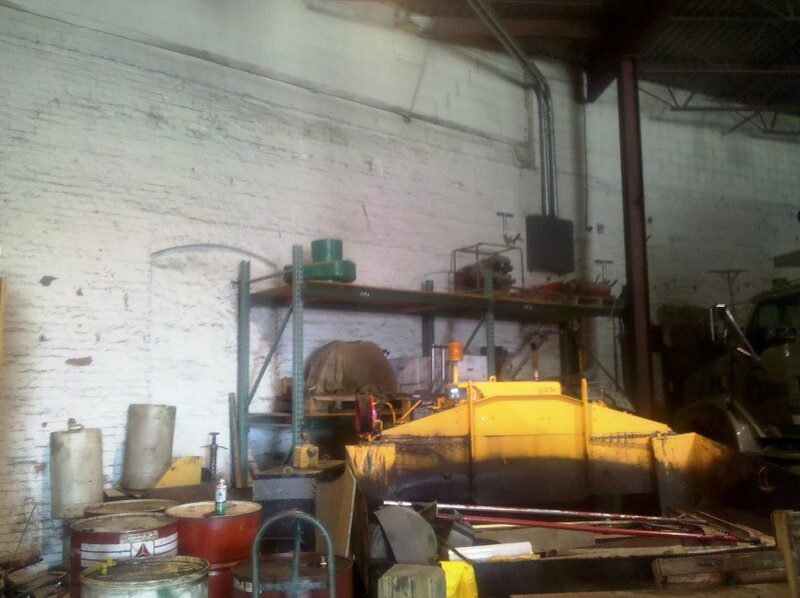 Blakeslee's engine was taking the siding here when it was struck behind the boiler head. The downward-pointing arrows show the dead ends of the siding. Apparently, meets here required the train that took the siding from the east had to back out to take the main again. 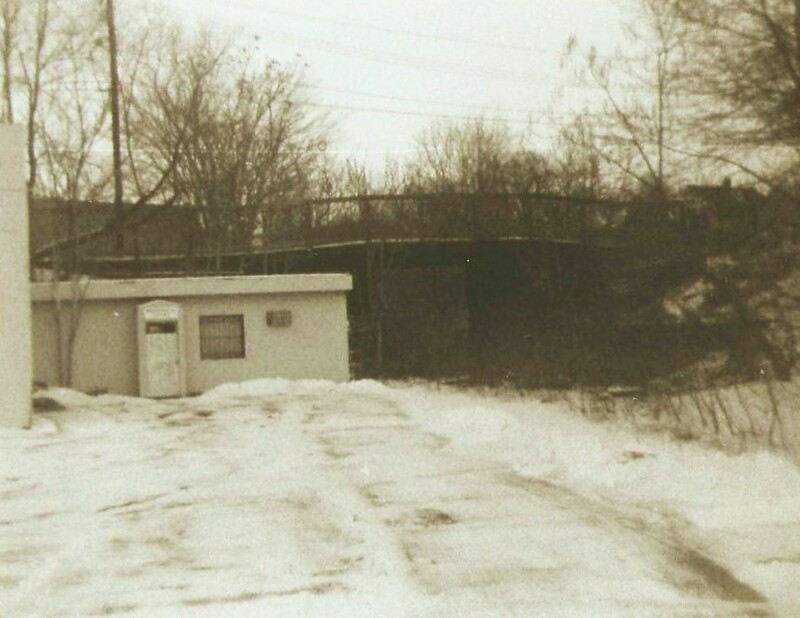 [4.39.1] This New Haven-era concrete culvert stood behind the housing unit on the west side of Glade St. in 1980 and is probably still there today. 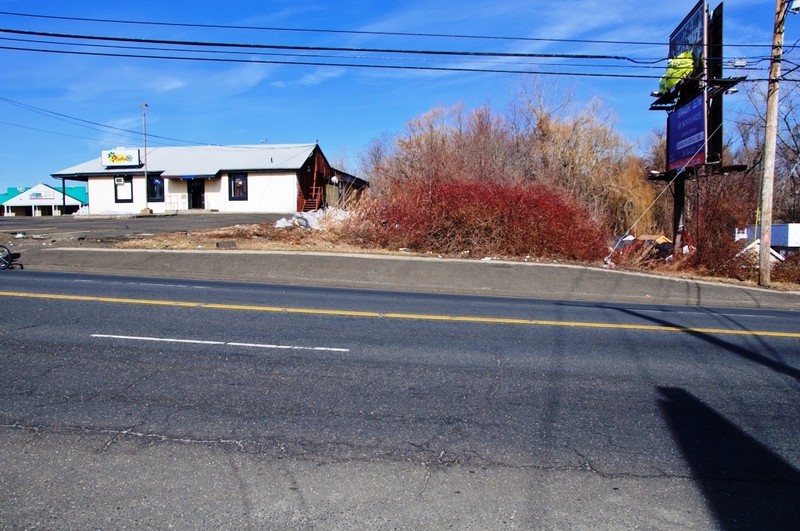 The infamous curve is visible here, just beyond the hospital property and the Allingtown siding. The NH&D is turning north and heading for the Boston Post Rd, known as Milford Tpke. when the Derby road opened. 4.40] A perusal of PUC Docket 3554 and PUC Map 632 at the Connecticut State Library has explained a number of things about this mile point 3.31 bridge that carried Milford Tpke., today's Boston Post Rd., over the NH&D line. This was built probably in 1921 as shown by the 7/9/1920 construction plans with revisions on 1/3/1921. The plans called for "malleable iron posts" as the guard rails. Never quite sure whether this was a grade crossing previously, which would have been unlikely on the main road from Boston to New York, we now learn that there was an earlier wood plank bridge here that sat on "rubble masonary abutments." This earlier bridge likely dated back to 1871 or to NH&D improvements in the 1880s. Due to increased traffic by 1920, the highway department saw the need for an upgrade. The old abutments were strengthened with concrete walls and the planks were replaced by a concrete slab for the roadway which was raised slightly for a 16-ft track clearance. 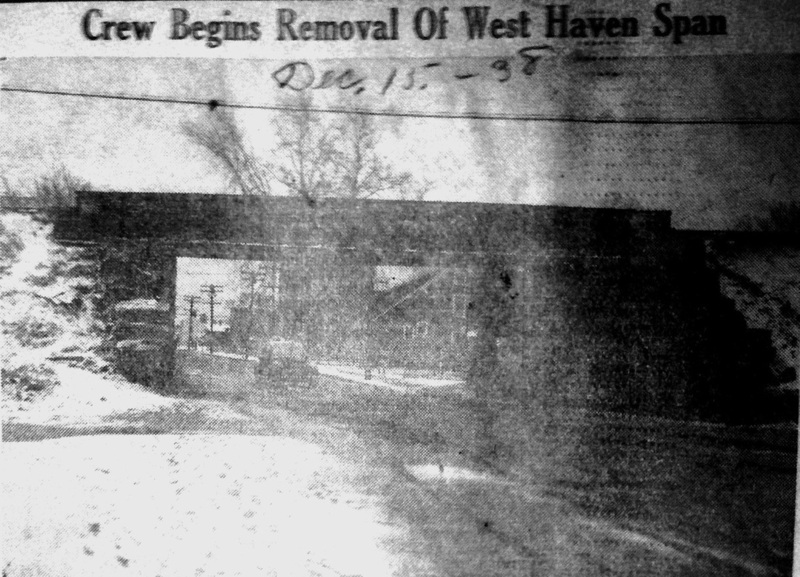 Our previous 1926 dating of this construction was based on a road-widening project in 1925-1926 - a temporary bridge mentioned in the Courant [HC/07/30/1926/06] may or may not have been in use here - and also on the the fact that we saw '1926' etched into the concrete side walls of the bridge as late as 1980. It is quite plausible that the side walls replaced the iron posts with the widening in 1926. [4.40.1] This is the same view looking north, railroad west, ca. 1980. 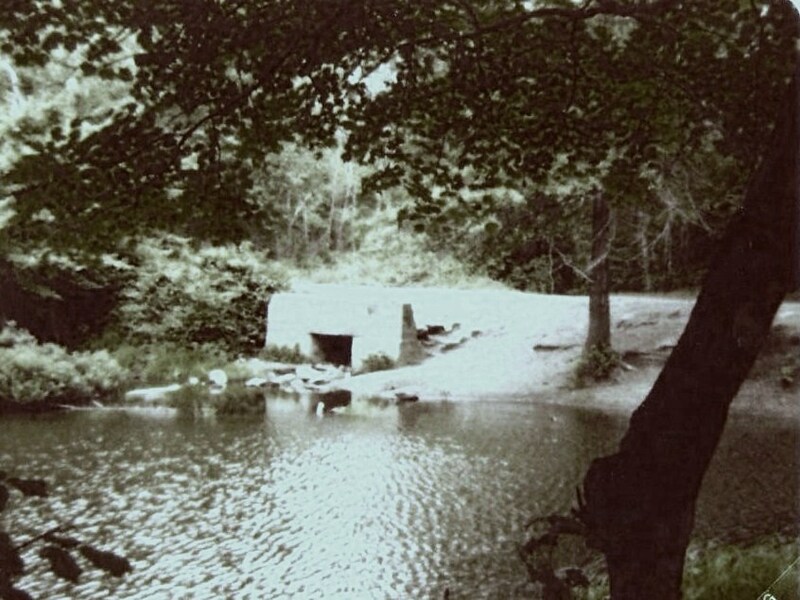 The box culvert is seen filled on this side. The bridge walls etched with '1926' have come down since the culvert ends have been capped and paved over. The sign for the Topps department store, which older residents will undoubtedly remember, is visible in the photo. 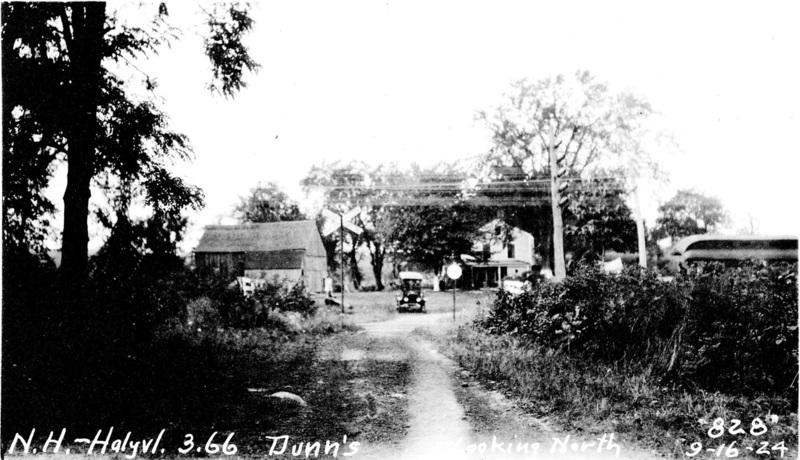 That building, on the north side of the Post Rd., is still in commercial use today. [4.40.2] Two more views of the Post Rd. 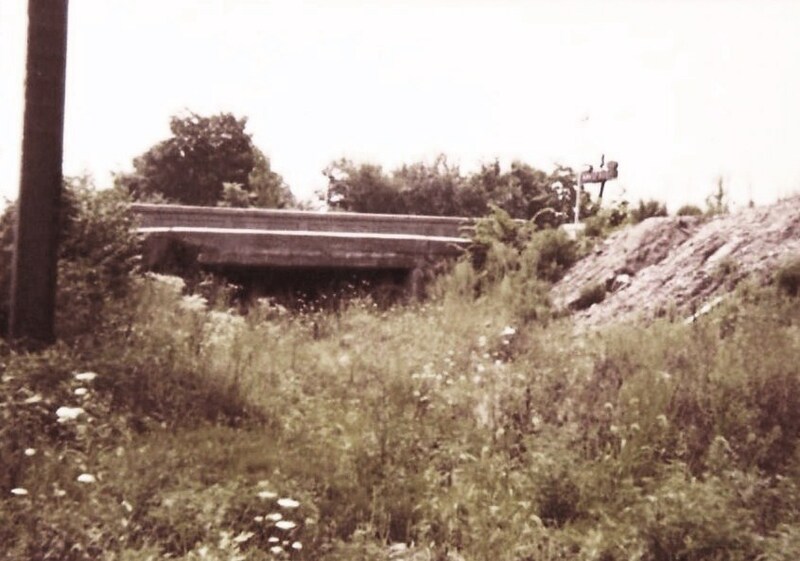 culvert, but looking south, railroad east, both also taken in the late 1970s or early 1980s. It was also noticed recently that the northern portal of this bridge the looks much wider than that of the box culvert seen in the photo of the southern portal just above. 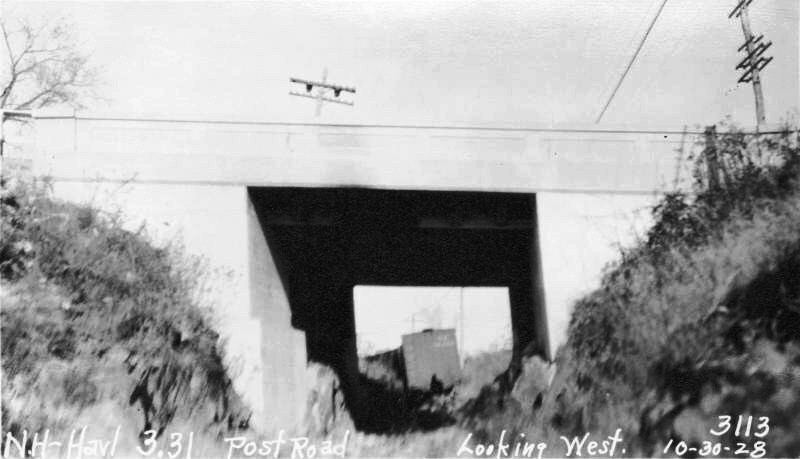 It now seems likely that this was part of the 1925-1926 widening of the Post Rd. when freight service was still available on the Derby line. If this were not all buried now, it would be fascinating to walk under the old tunnel, something we regret not doing back in 1980, if it was even passable then. .40.3] Using the 3.31 mileage designation for the Post Rd. 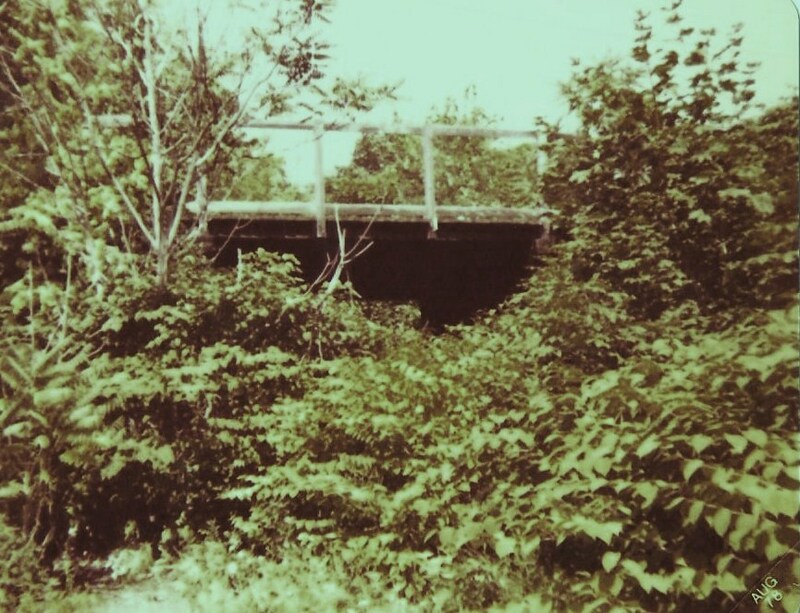 bridge, it would put Dunn's crossing at 3.66 above the Post Rd. Comparing this photo with the map below, the road even appears to bend to the right where the old automobile is sitting. This was the meeting point of Farwell St. and Fresh Meadow Rd., as seen on the map. 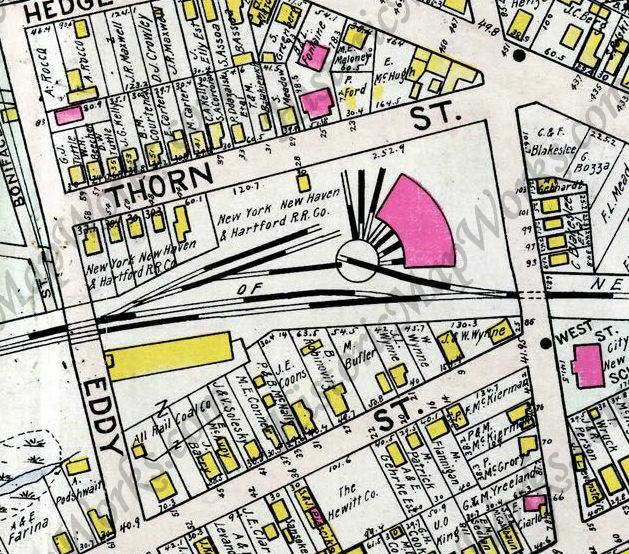 [4.40.4] This map from the 1925 Price and Lee New Haven city directory shows the area. 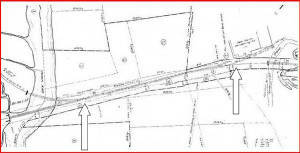 Dunn's crossing is indicated by the blue arrow at the jog where Farwell St. and Fresh Meadow Rd. meet. Note the advisement on the far left saying that this railroad line goes to Derby, Danbury, Waterbury, and Winsted. Passenger service would end shortly. Additionally the crossing of the Post. Rd. is correctly indicated as passing under the road, an accuracy of detail not always seen on these maps.